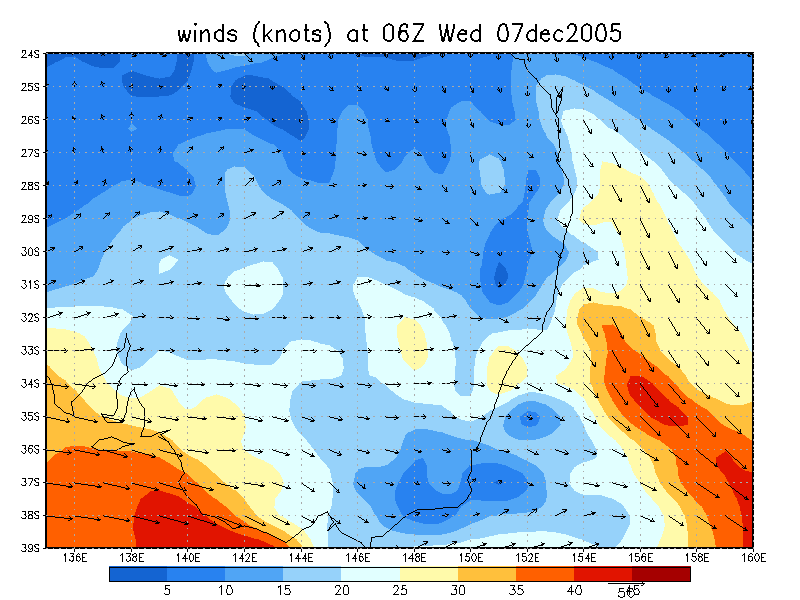 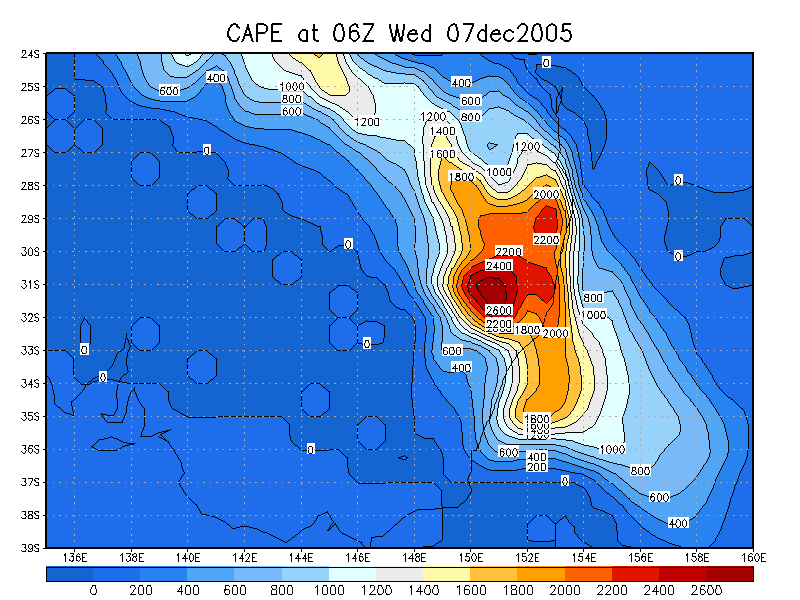 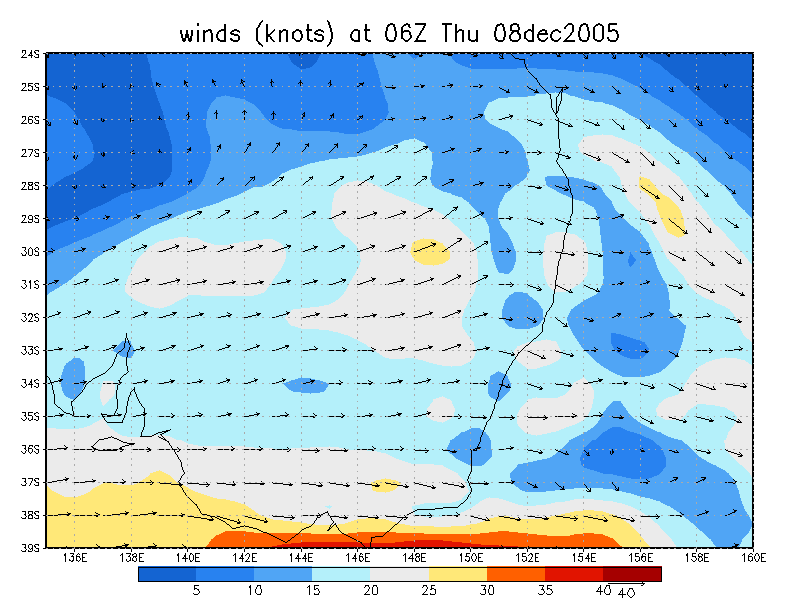 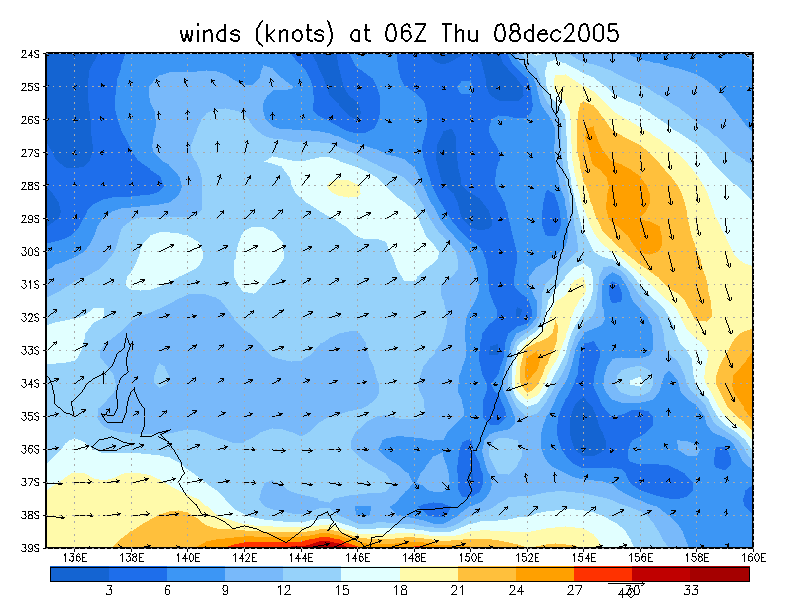 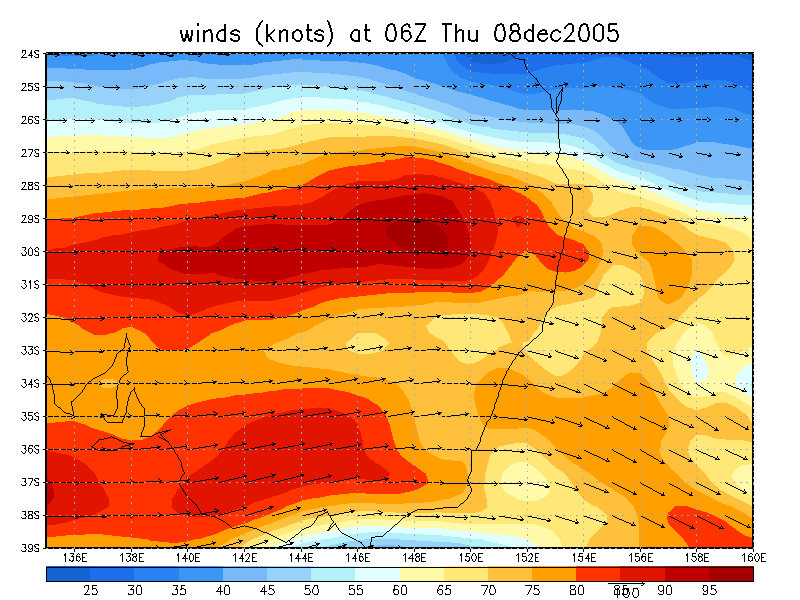 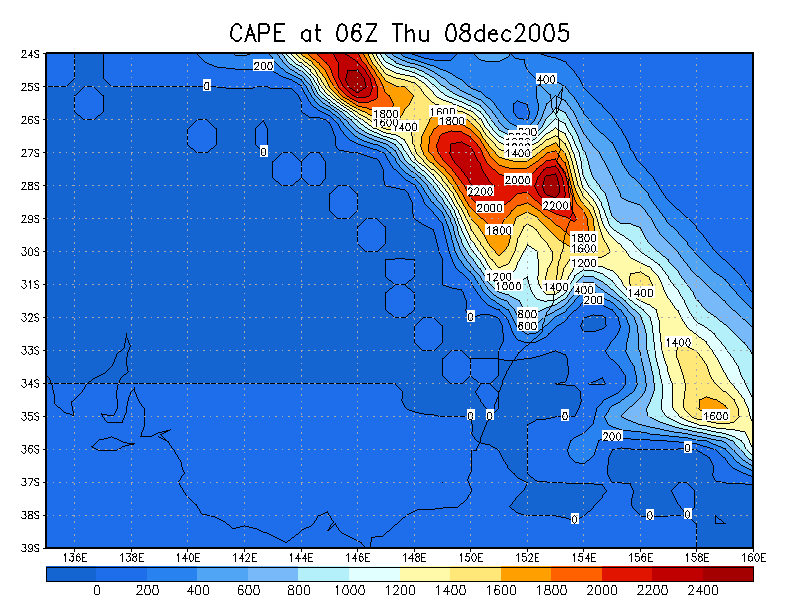 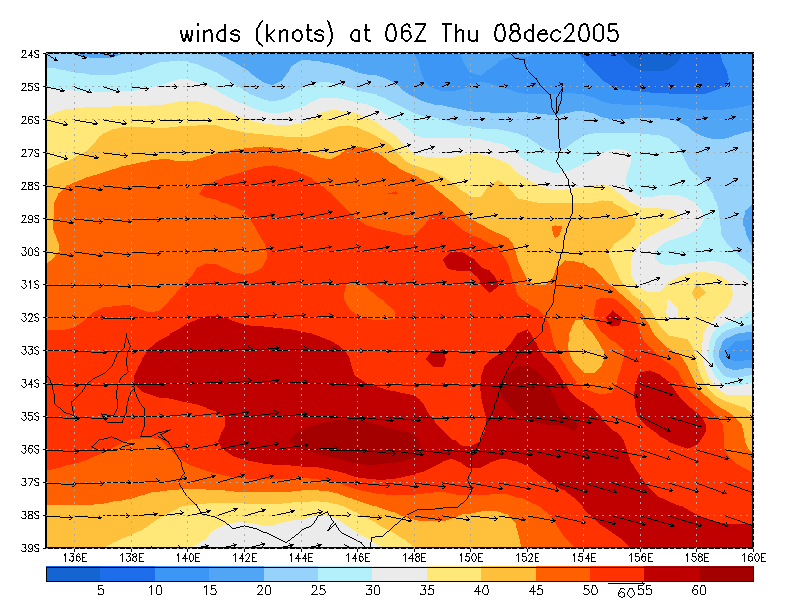 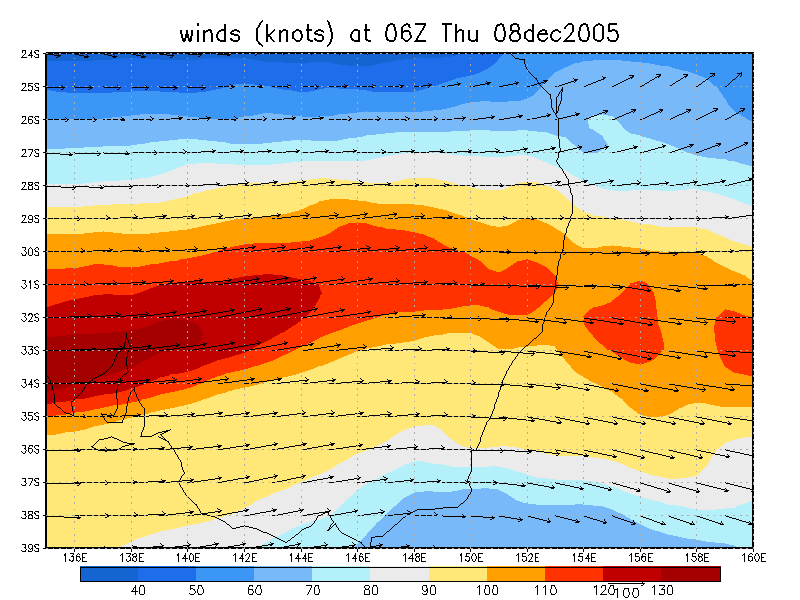 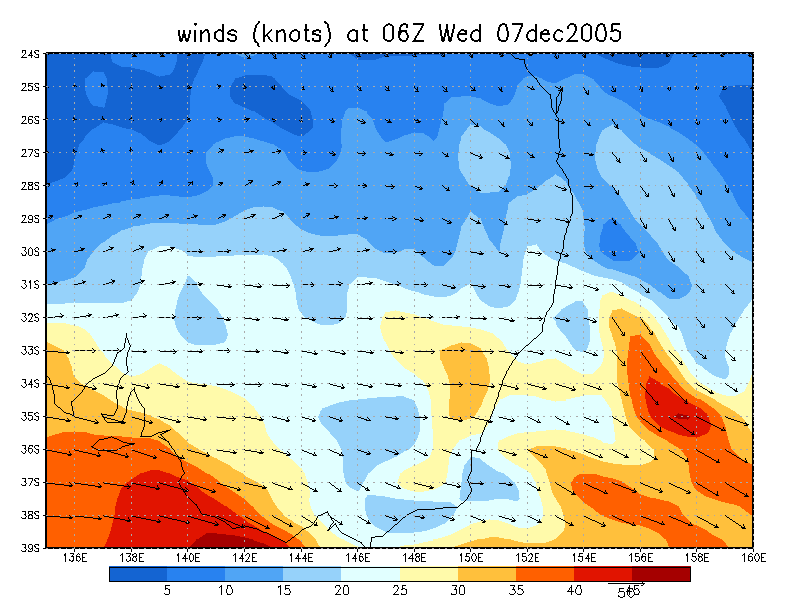 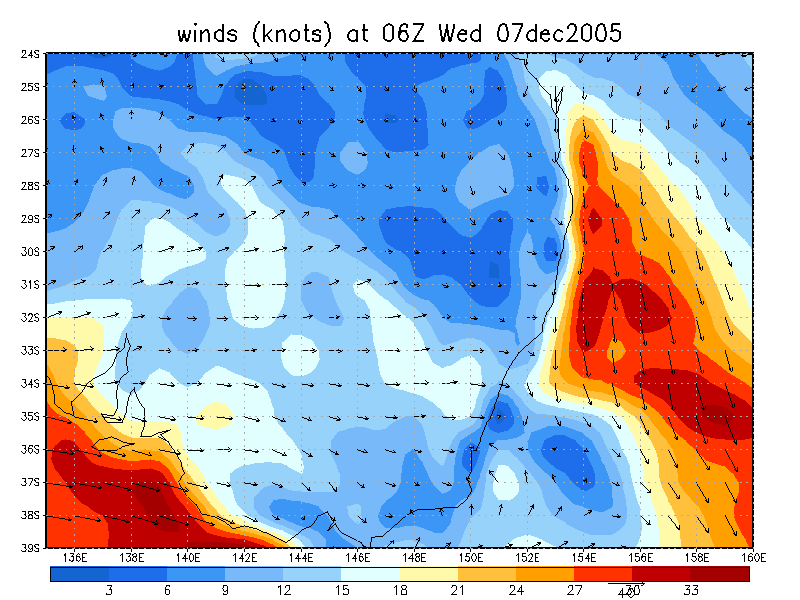 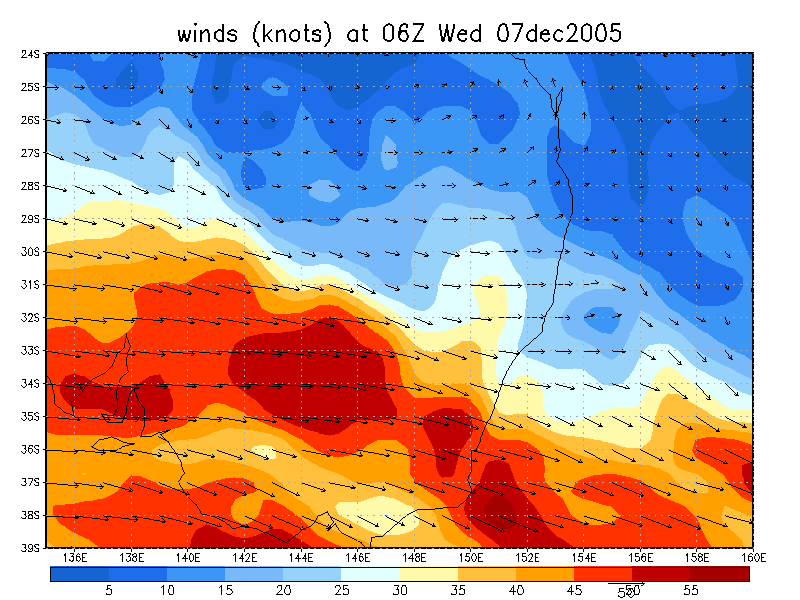 GFS was forecasting a really unstable atmosphere, with CAPE values of around 2500 j/kg right over our part of the Northern Rivers. 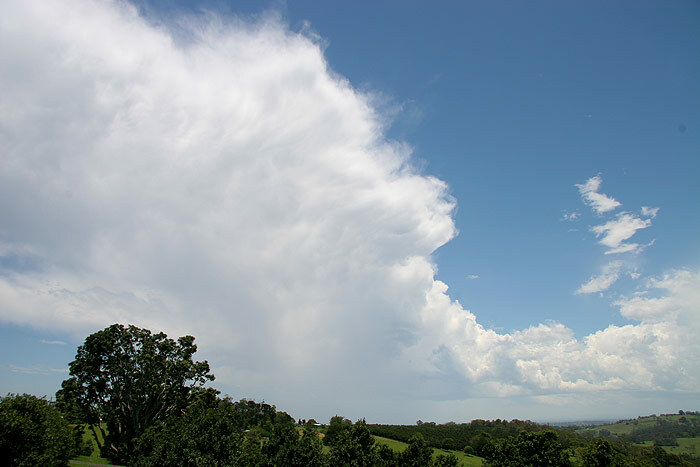 Wind shear was nice, though with little turning, however moisture and capping was going to cause a few problems, which became clear during the afternoon. 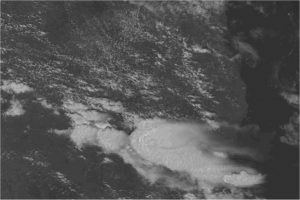 Storms had tried to develop all afternoon in the region, but with no success thanks to the strong cap and lack of deep low level moisture. 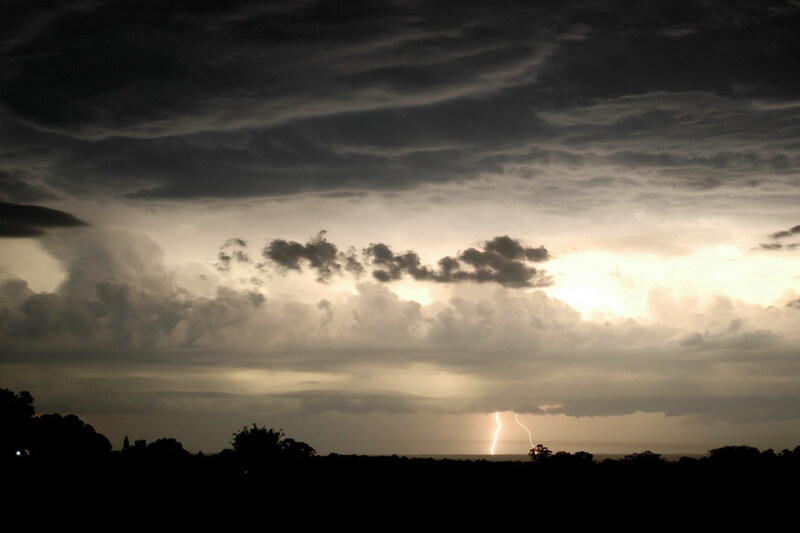 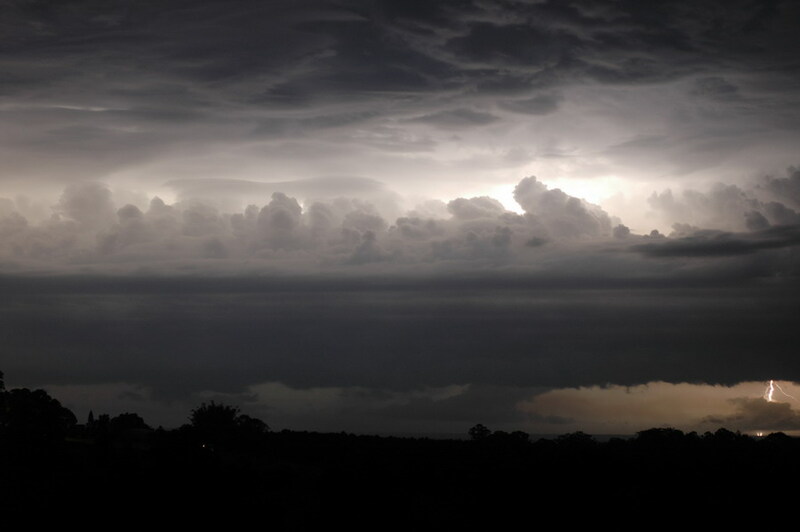 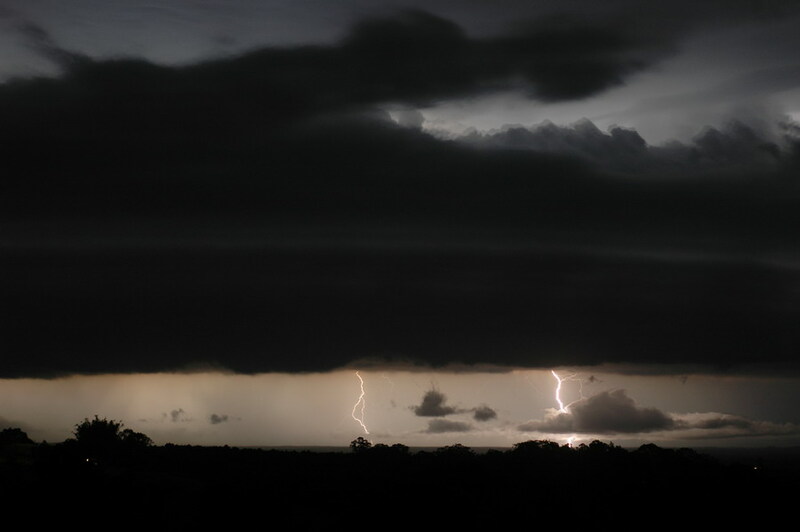 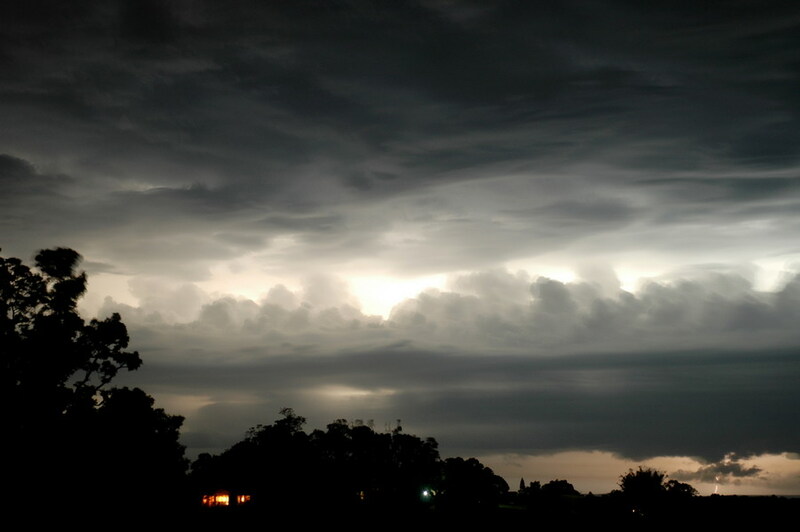 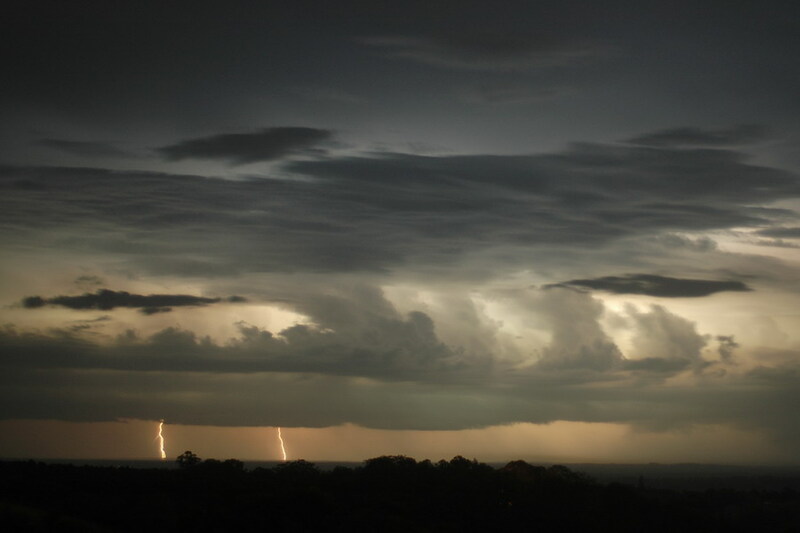 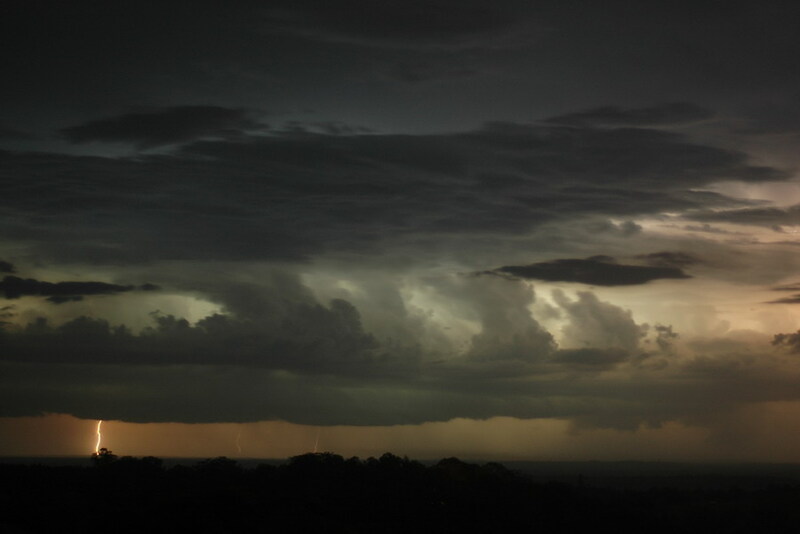 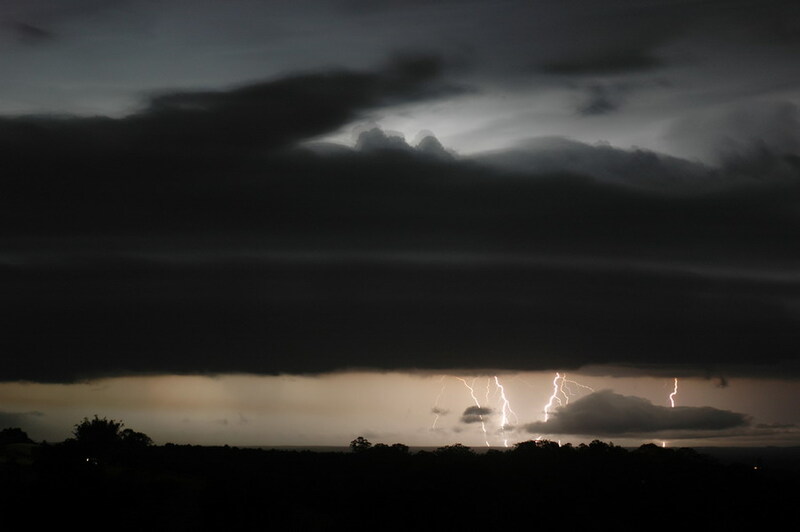 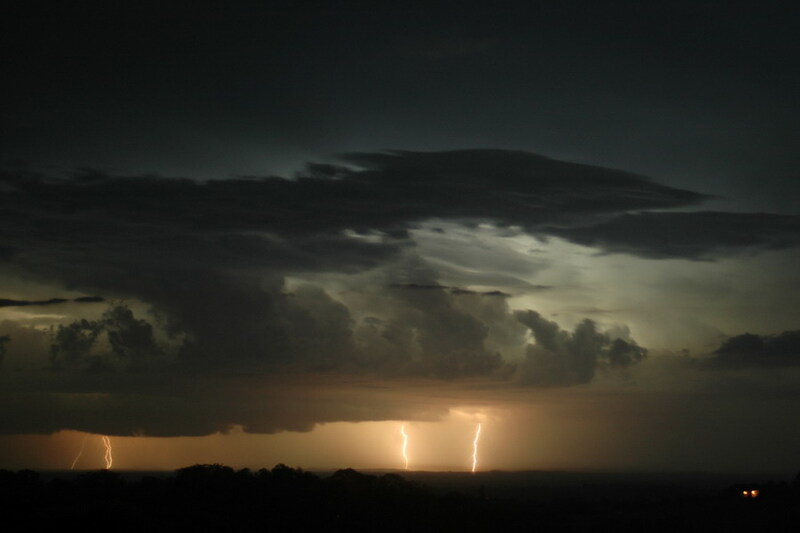 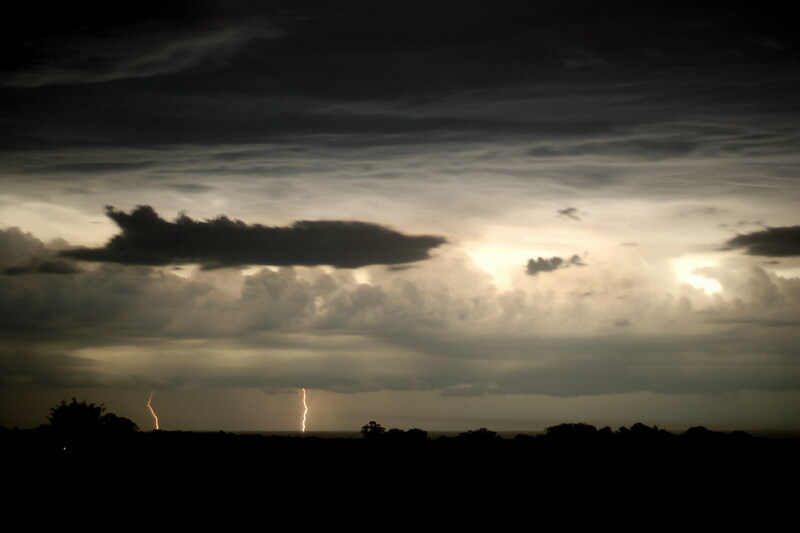 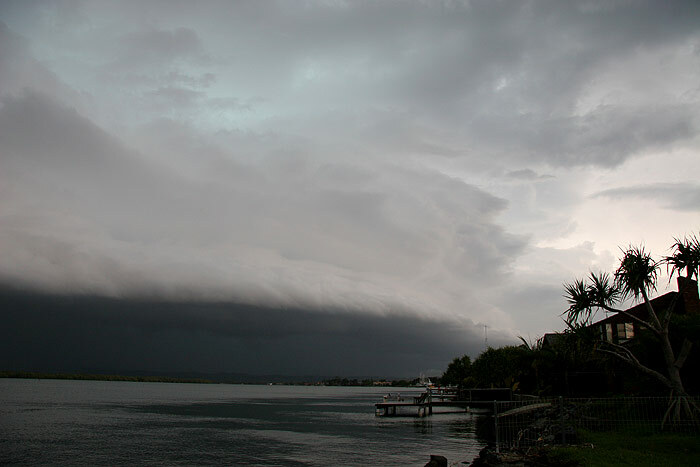 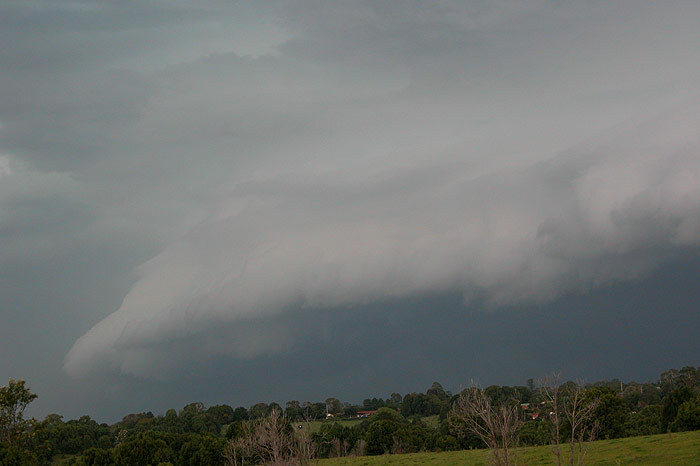 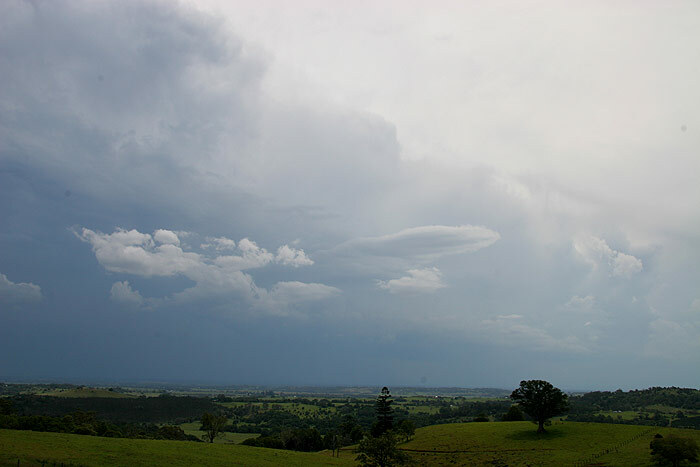 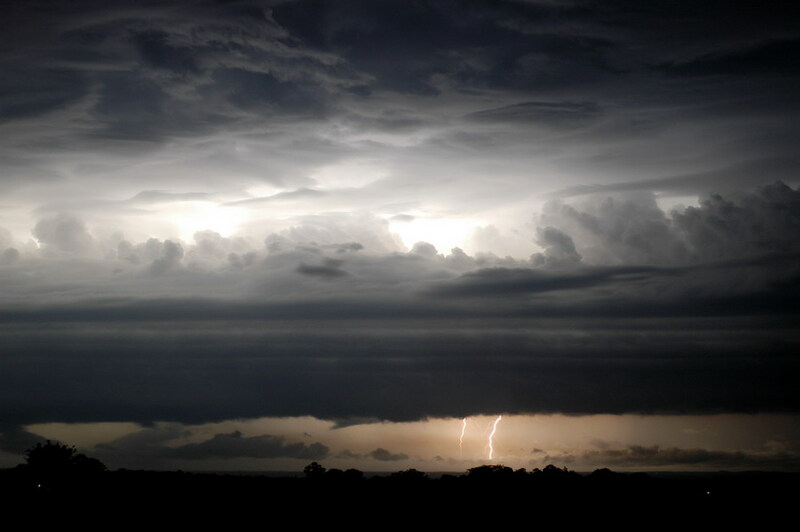 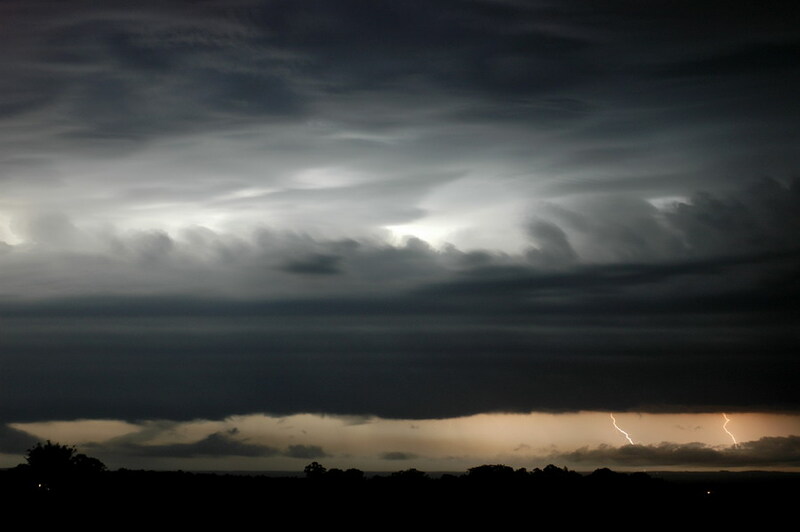 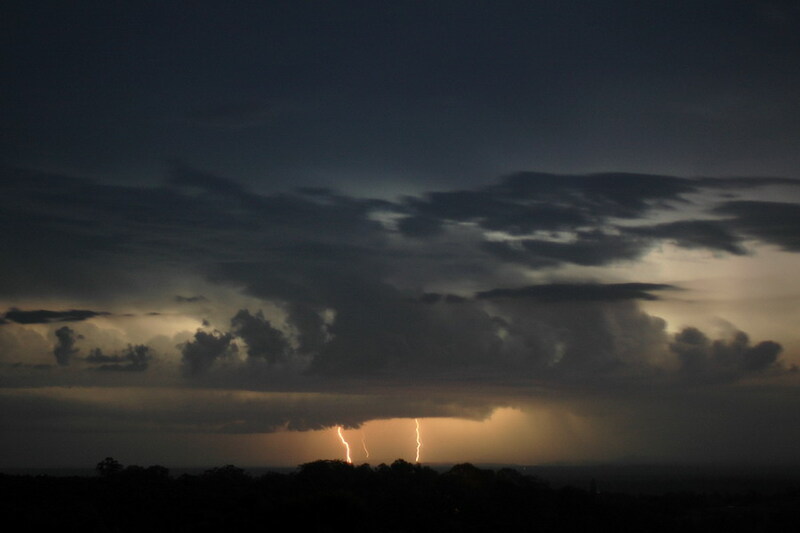 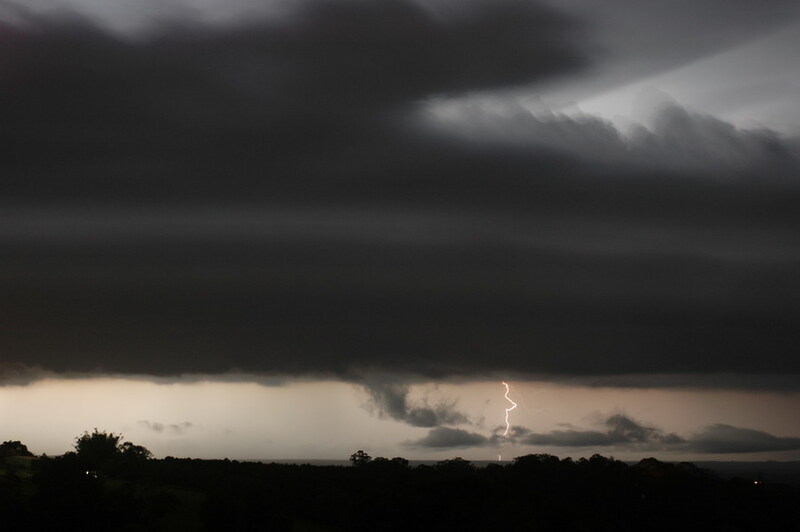 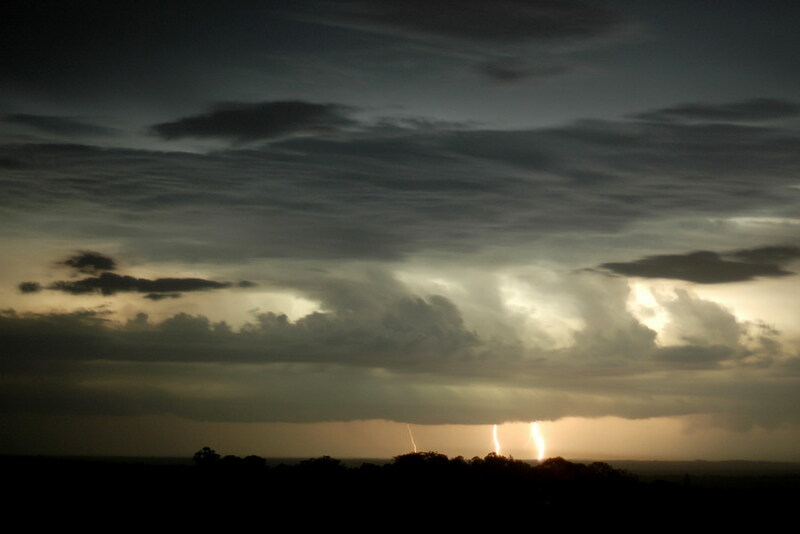 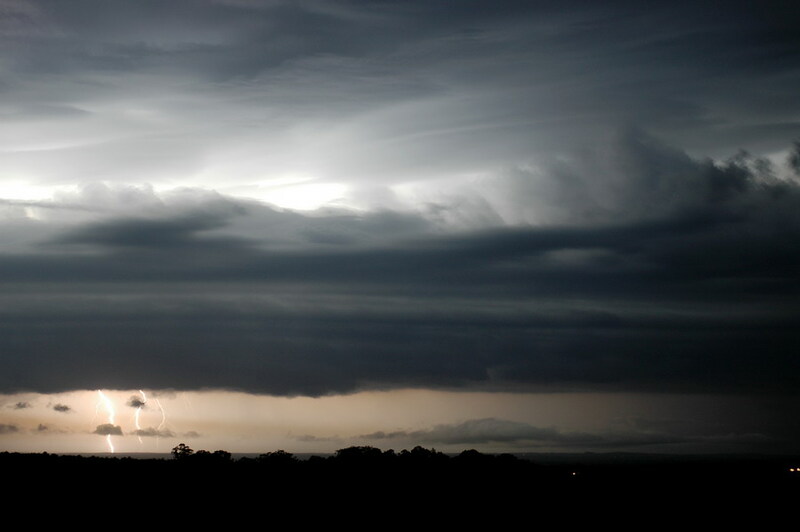 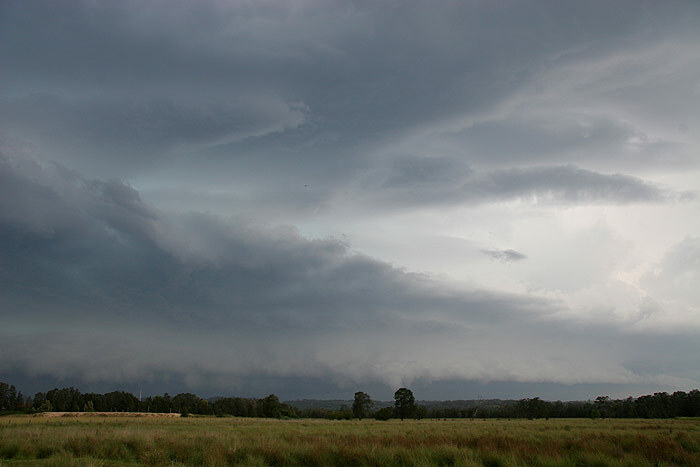 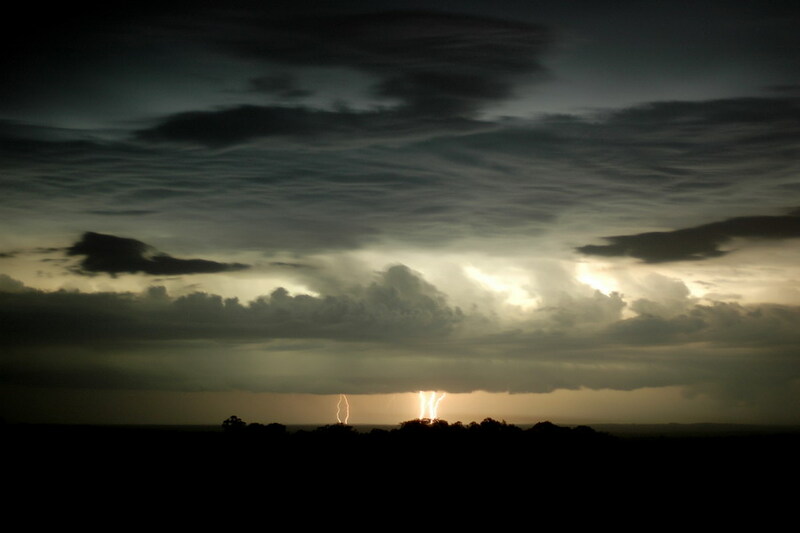 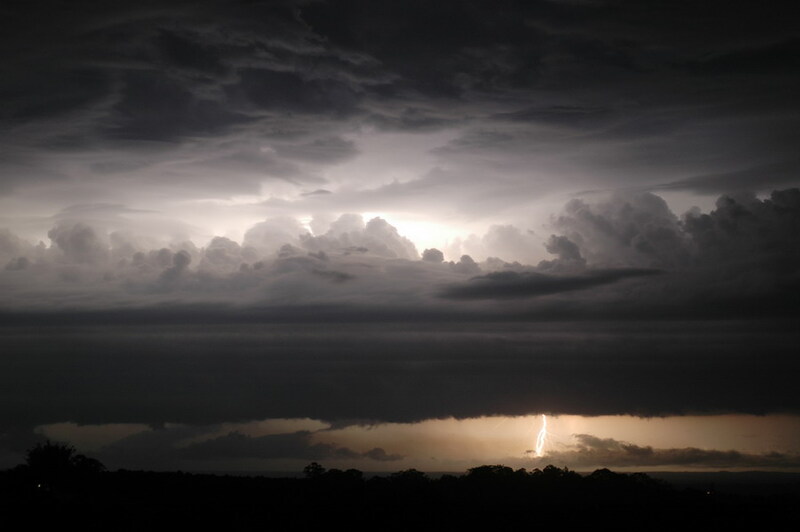 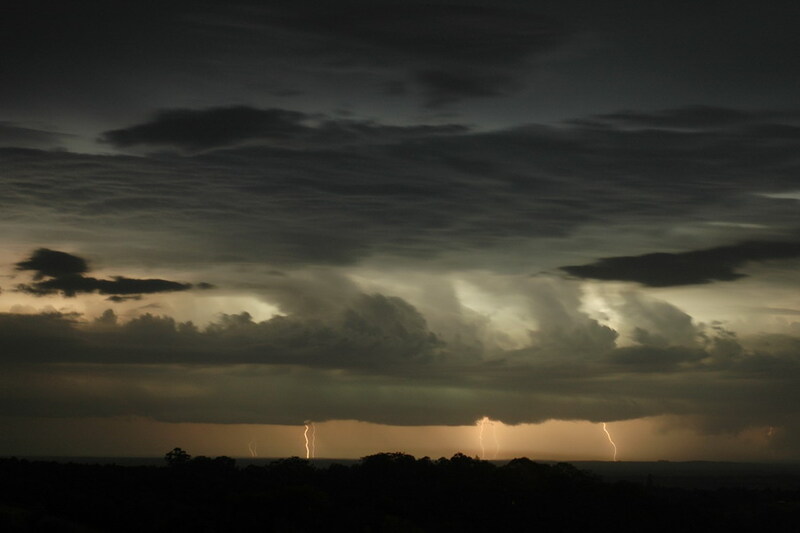 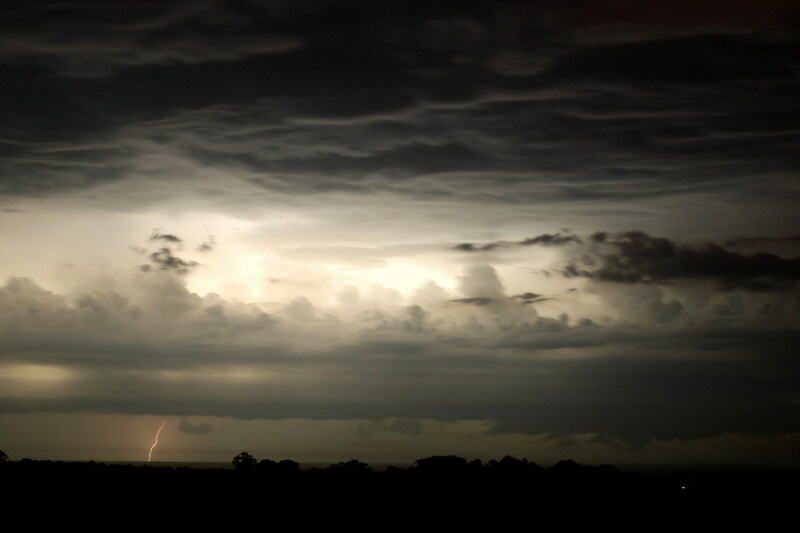 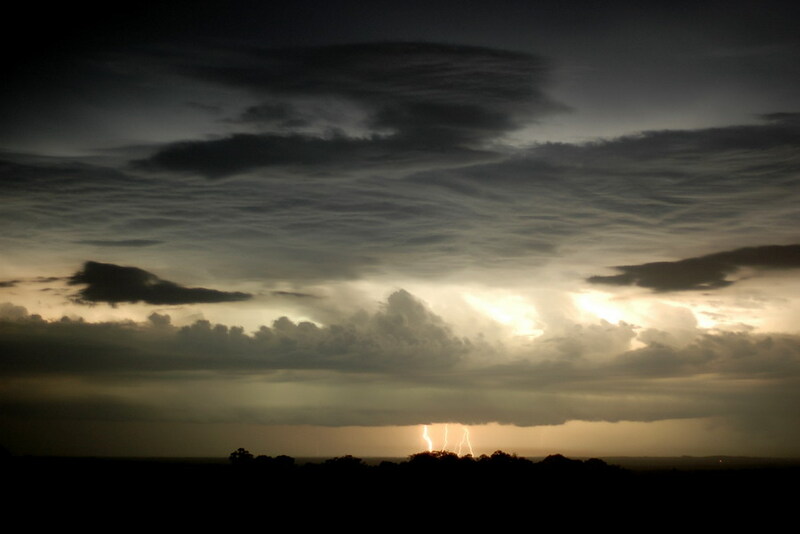 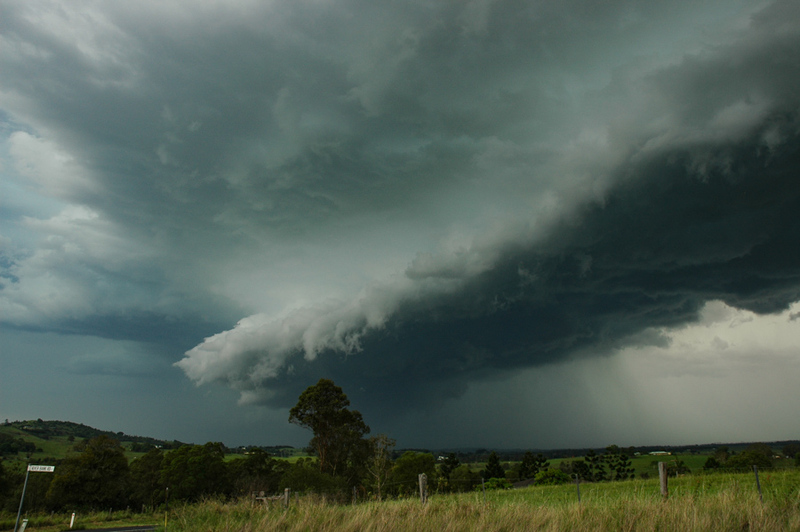 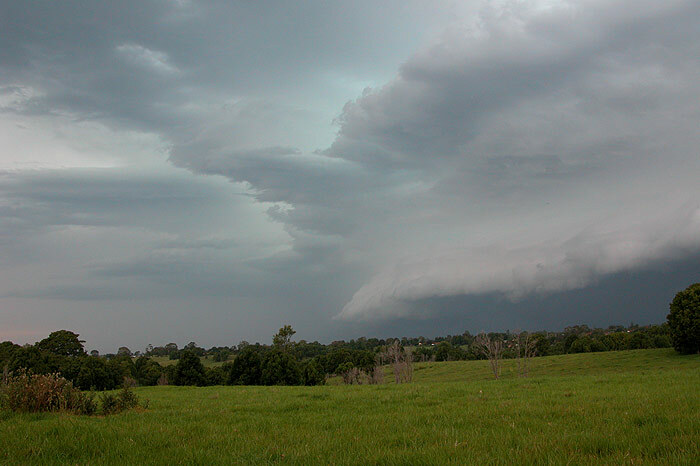 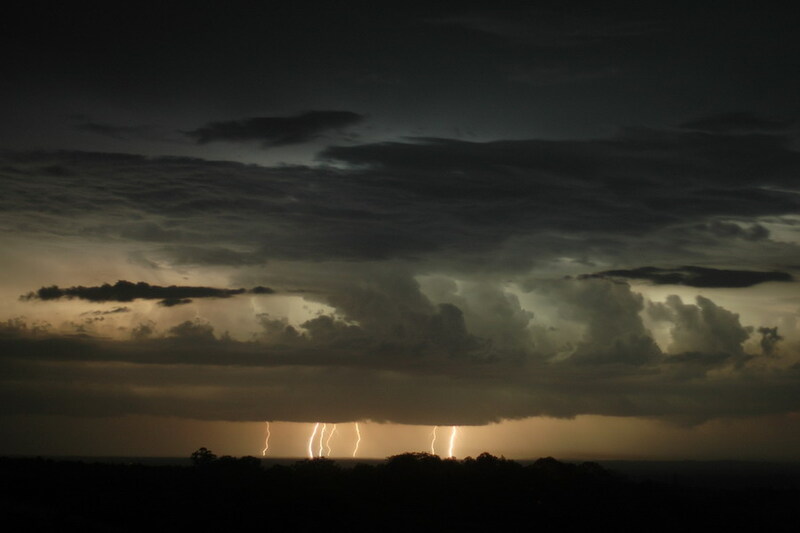 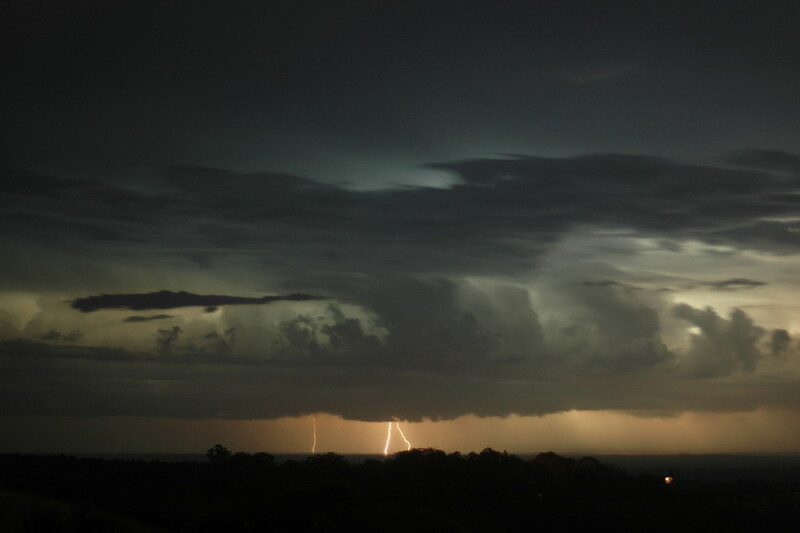 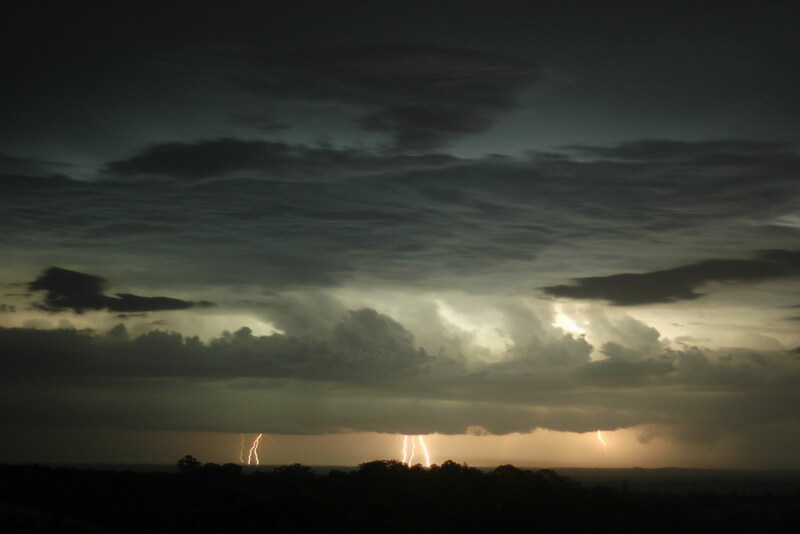 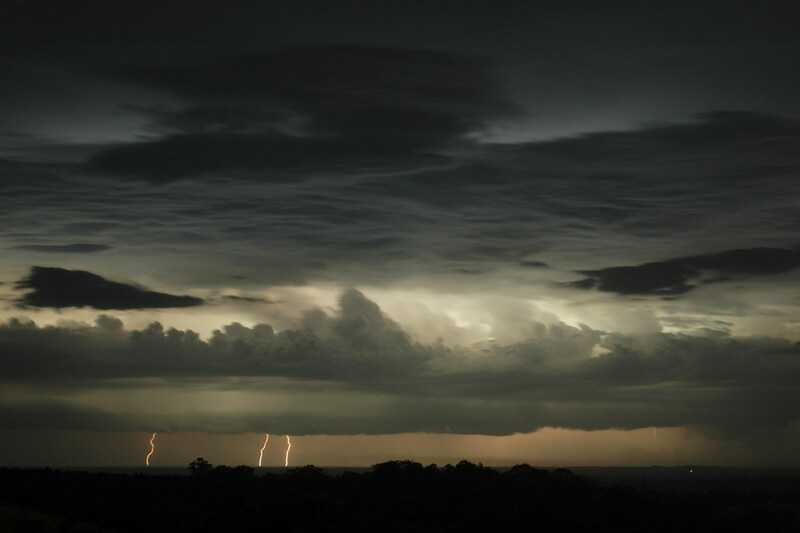 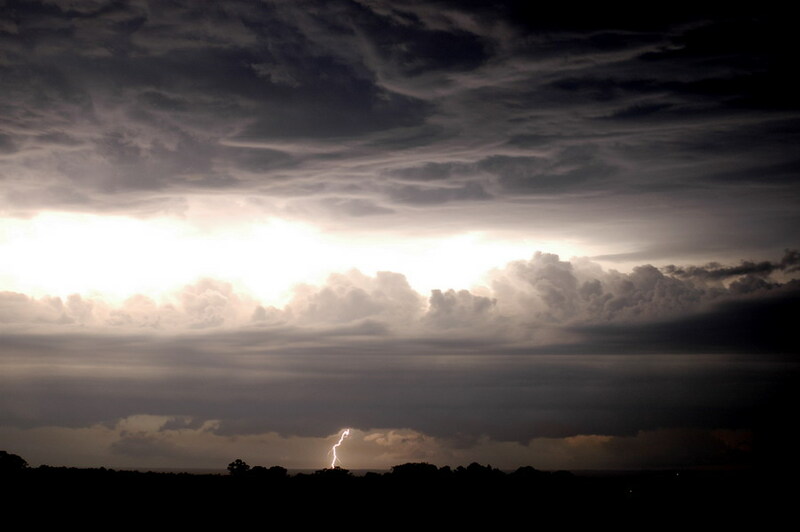 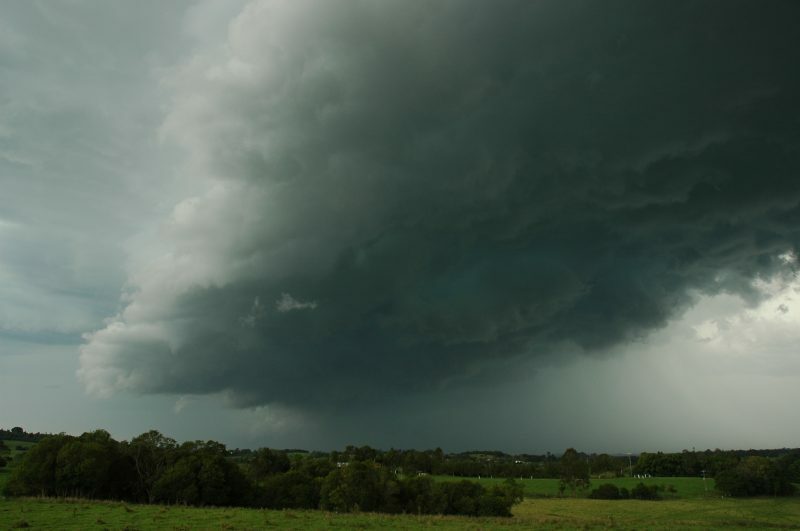 Severe storms were however developing along the Northern Tablelands and Mid North Coast. 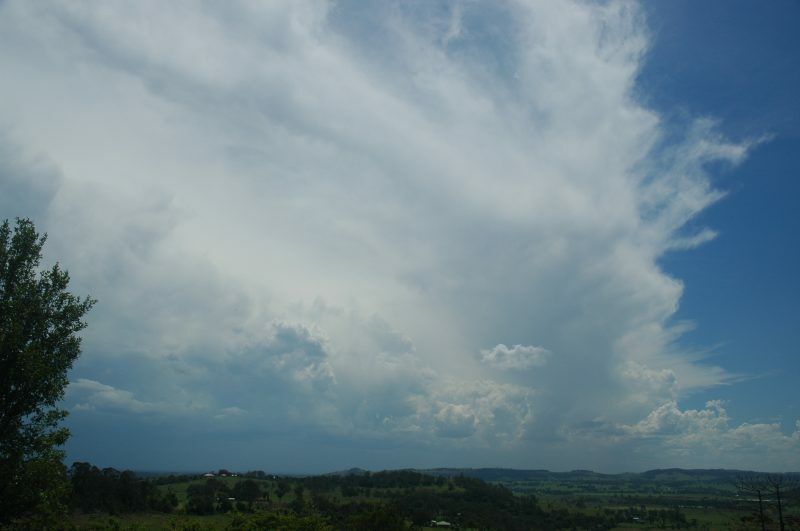 Around 5.30pm one cell looked to have finally broken through around the Mallanganee area. 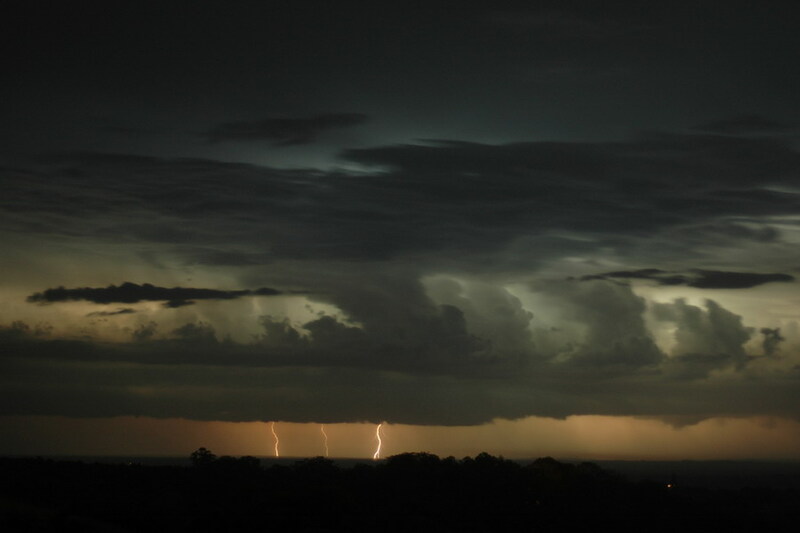 After observing quite powerful looking updrafts to my WSW, Michael, Rod and I decided to head out after it. 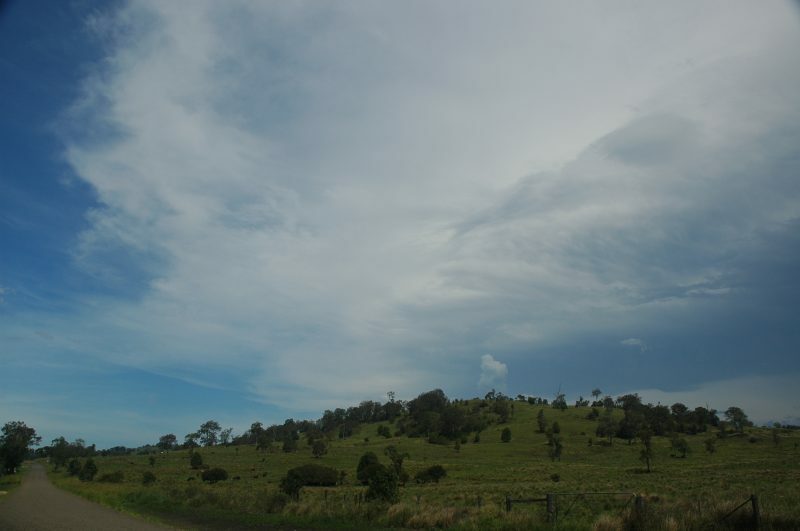 On the drive along Skyline Road it become clear just how high based this storm was, and it was already well and truly decaying. 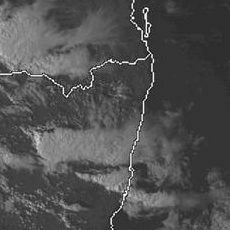 A lot of mid and high level cloud had now developed and covered most of the area. 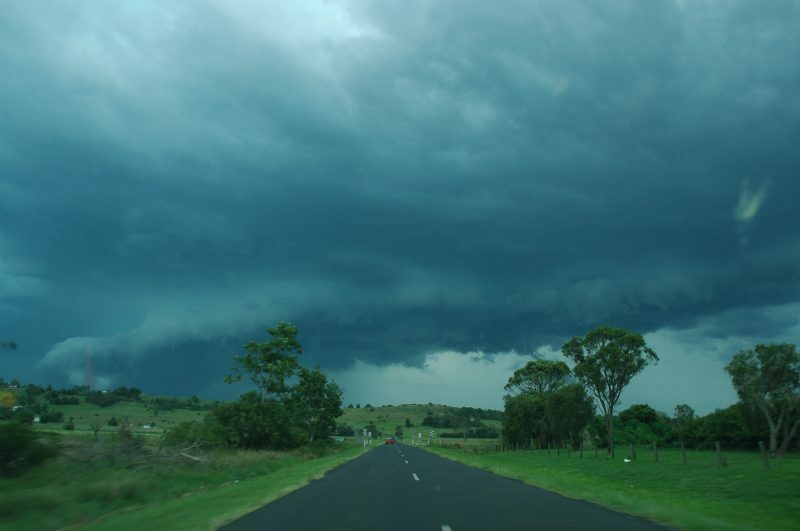 We headed back home, desperately hoping the severe storms on the Northern Tablelands would make it to the Northern Rivers. 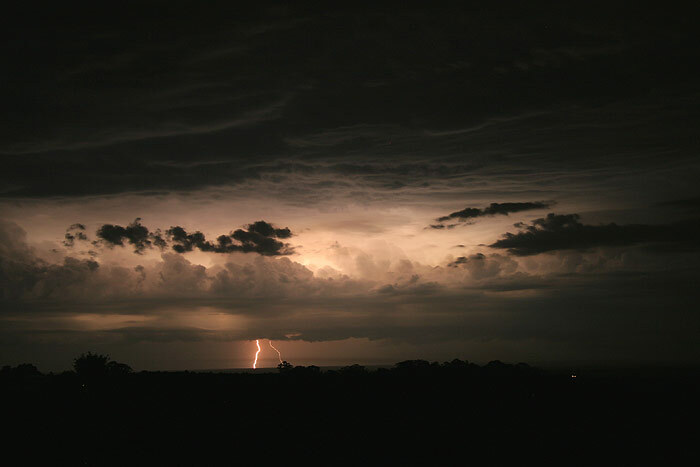 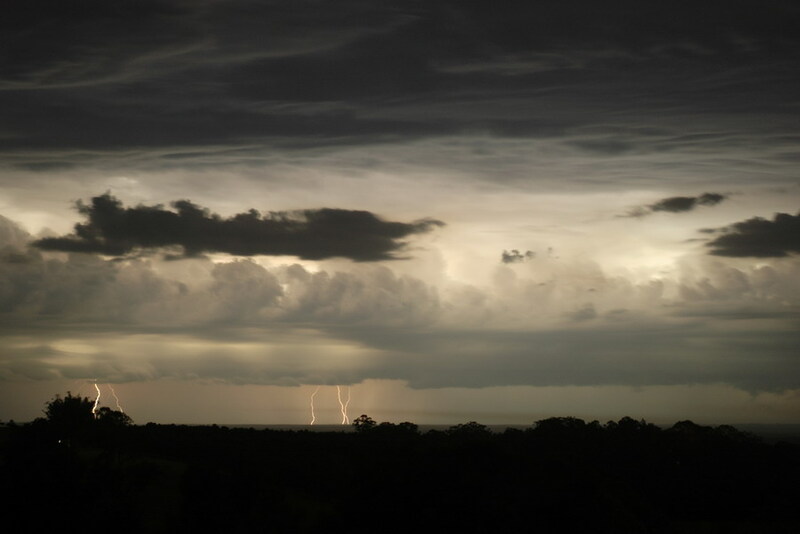 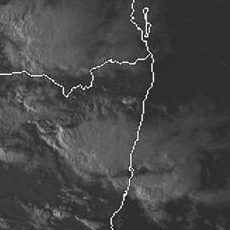 As the sun set, lightning became visible from the S round to the WNW, as a disorganised mass of storms developed near the Northern Tablelands/Northern Rivers border. 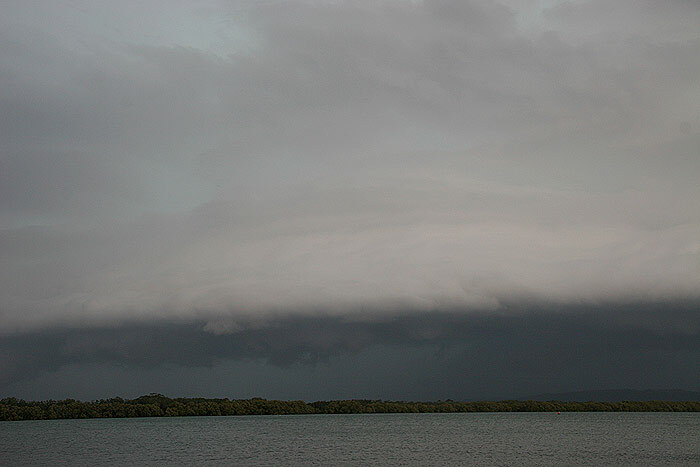 Michael initially headed out to Tregeagle, with Rod and myself meeting up with him there a short time later. 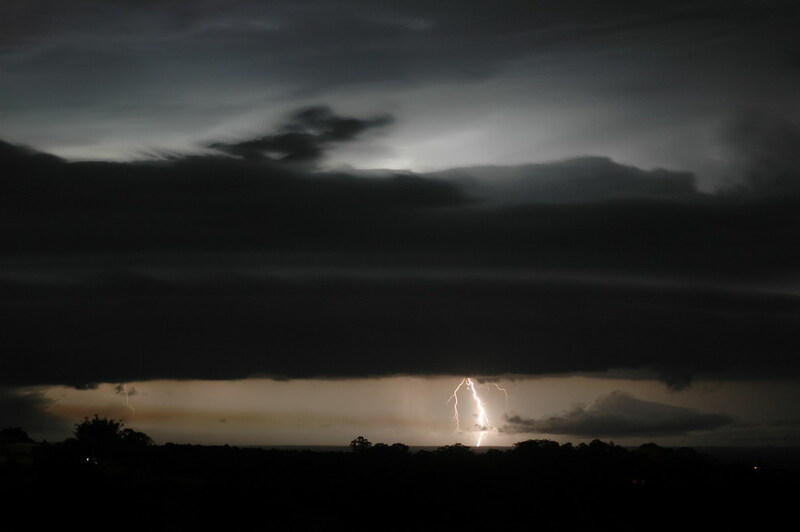 It is safe to say lightning was constant nearly the whole time, and despite this being mostly in cloud lightning, there were quite a few CGs occurring. 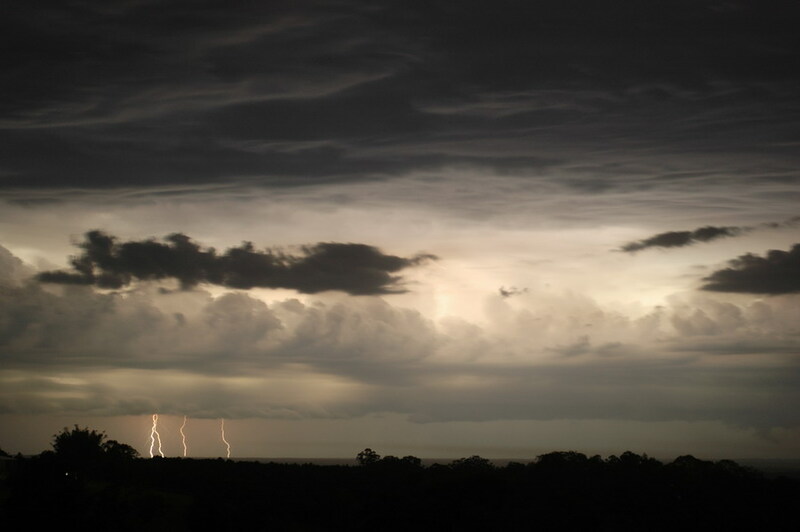 The action was all rather distant still. 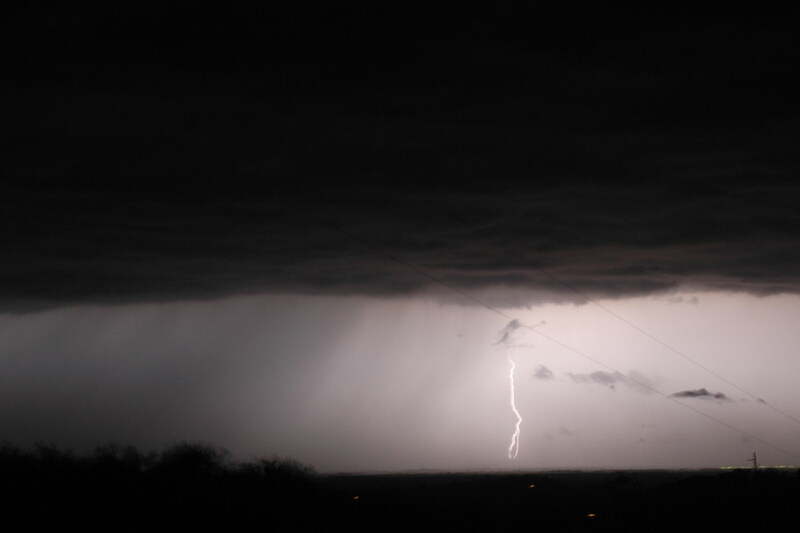 We enjoyed the show as the cells eventually moved closer. 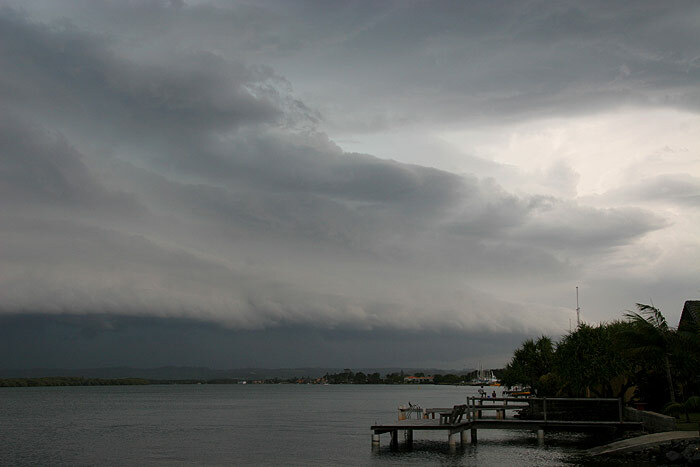 Soon we could make out a shelf cloud that had developed on the outflow ahead of the storms. 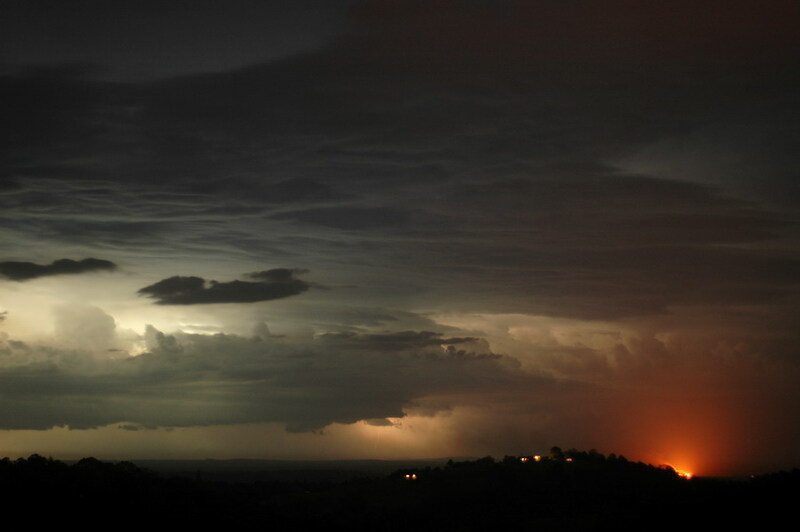 It looked quite dramatic, and in some ways it was a shame it was night time as we couldn’t get very good photos of it! 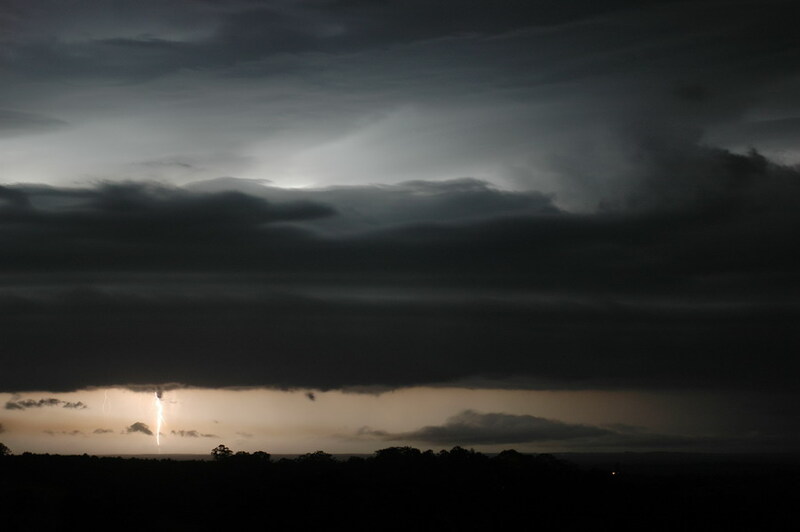 Most of the cells seemed to be pushing out to sea now, and with strong outflow blasting through the area as the gustfront moved overhead, we called it a night after a few last photos. 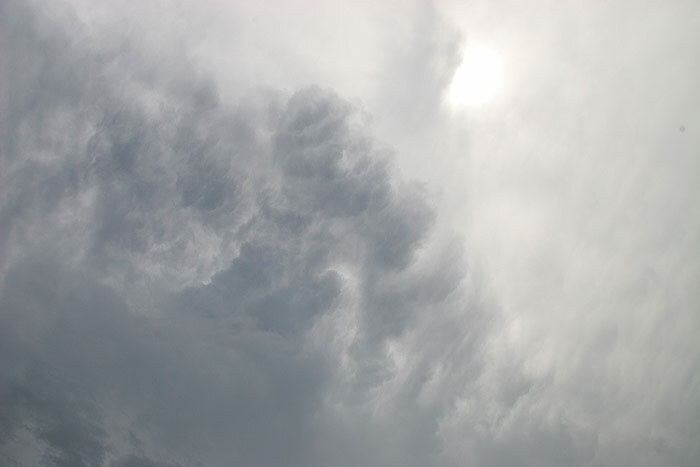 What hot weather it had been! 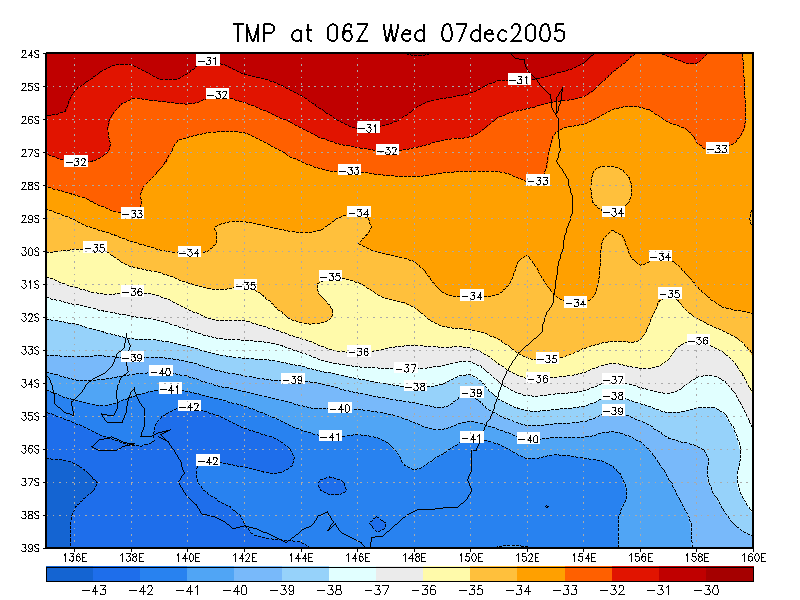 With temperatures getting into the mid to high 30s, mixed with dewpoint temperatures in the low 20s, it had been quite oppressive. 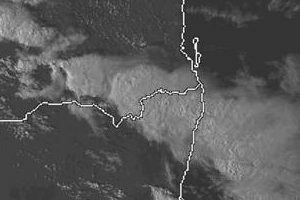 Despite the higher temperatures, it was still hoped that the trough system lying across NE NSW would fire off some decent storms. 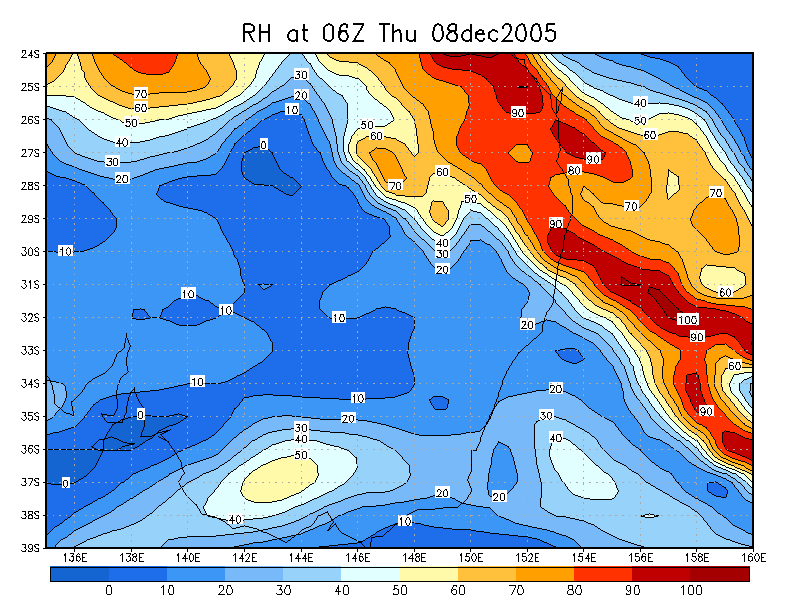 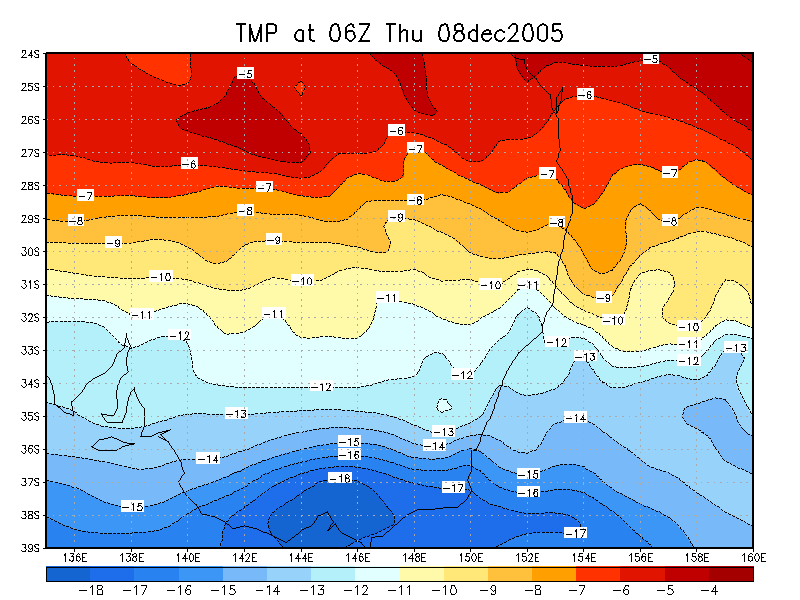 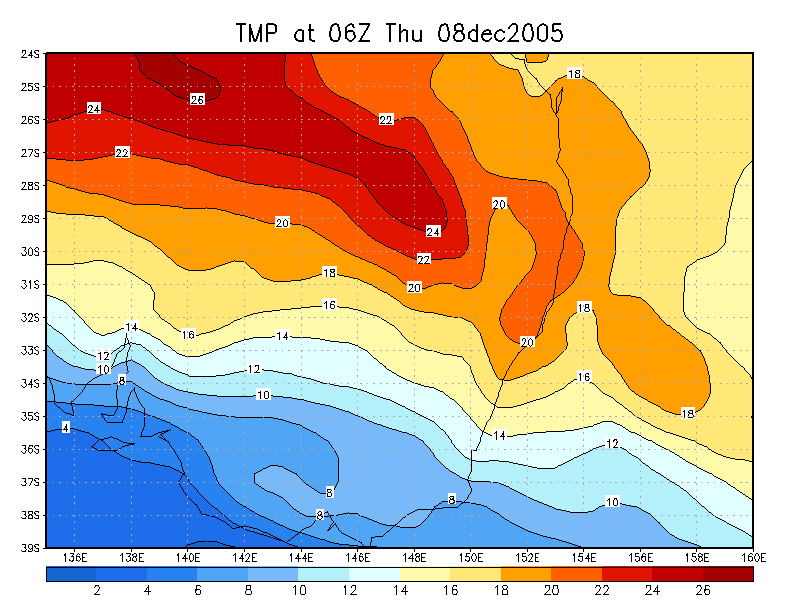 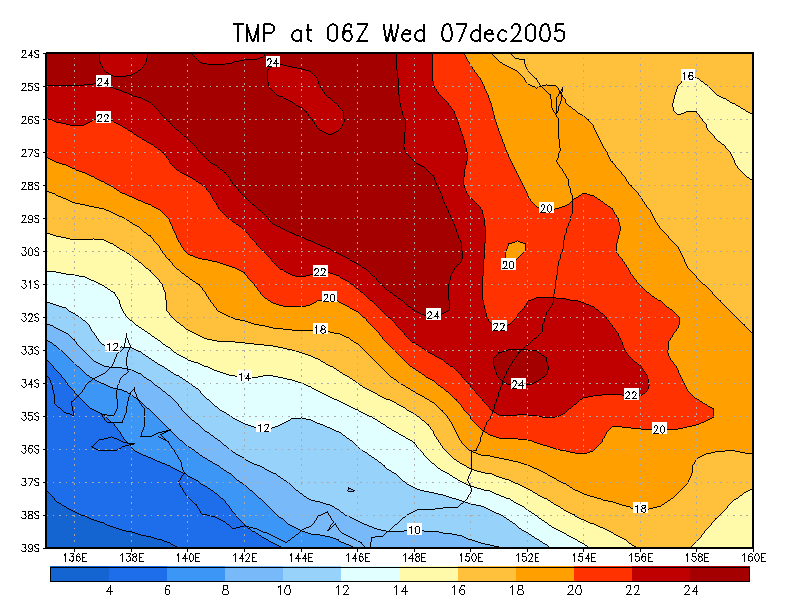 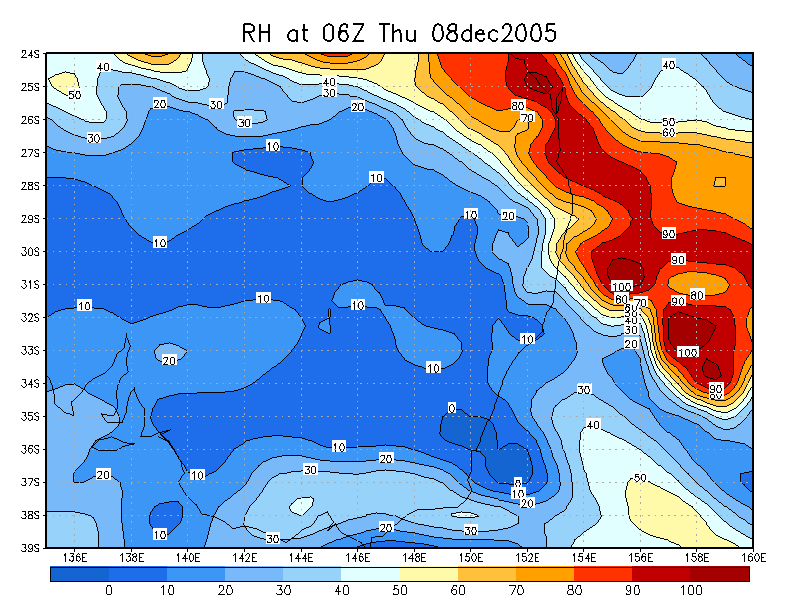 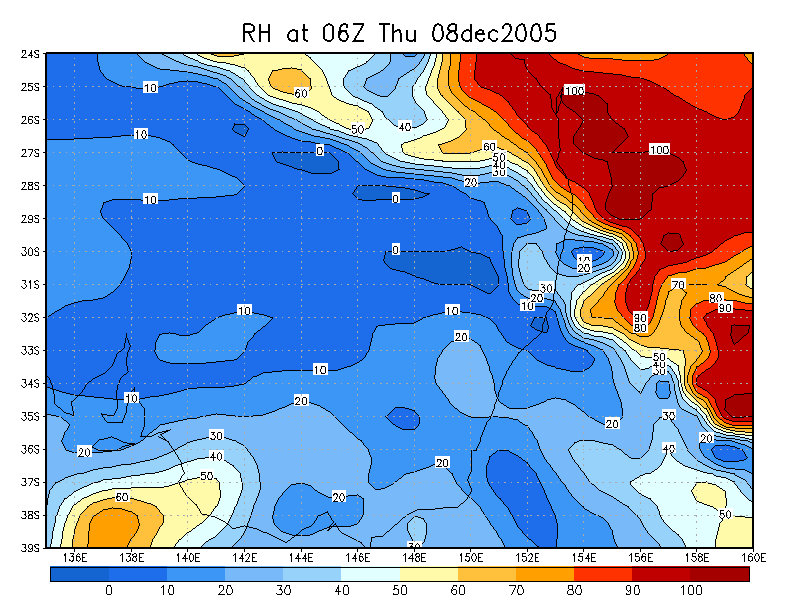 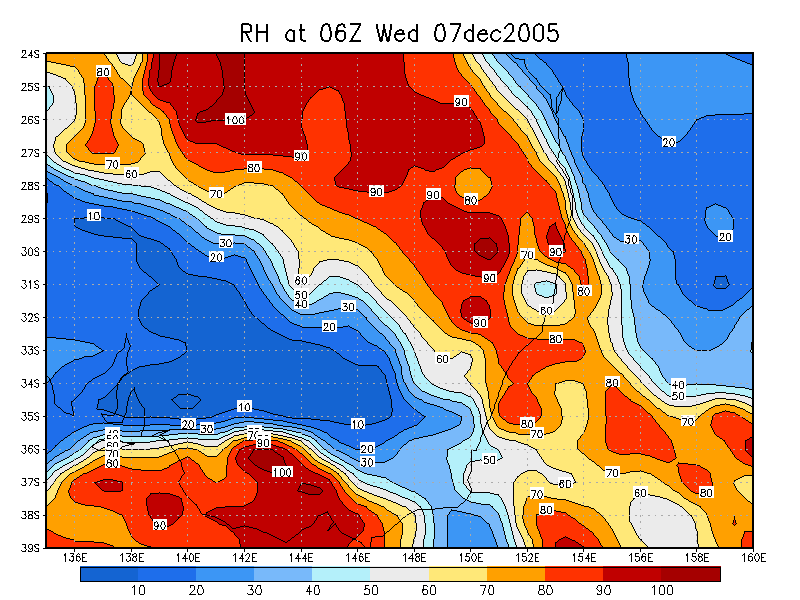 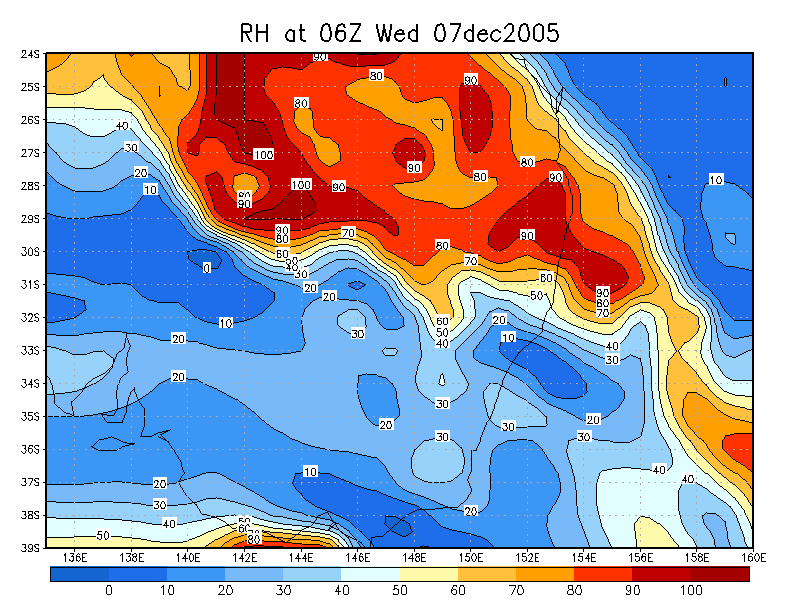 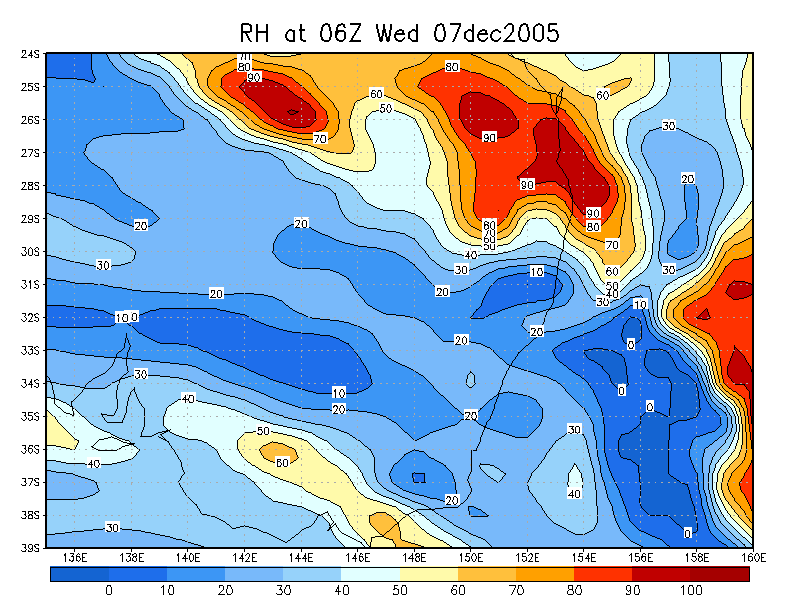 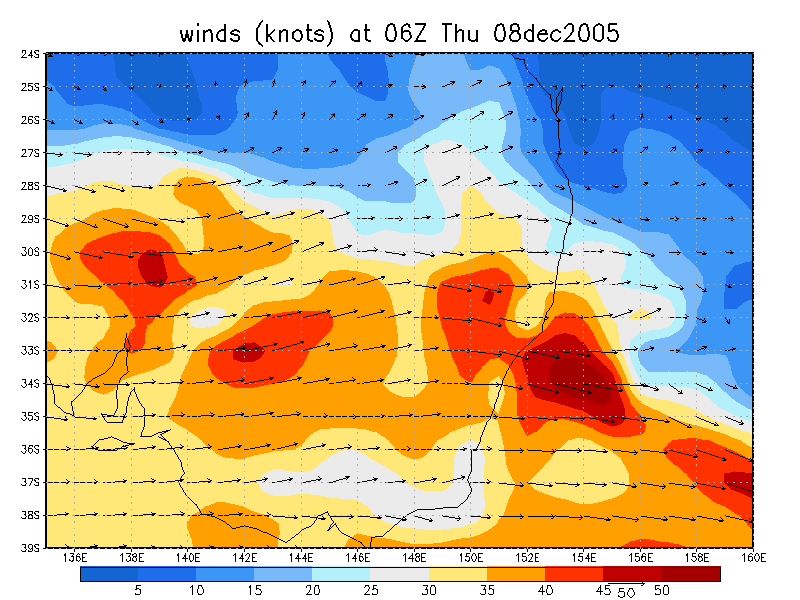 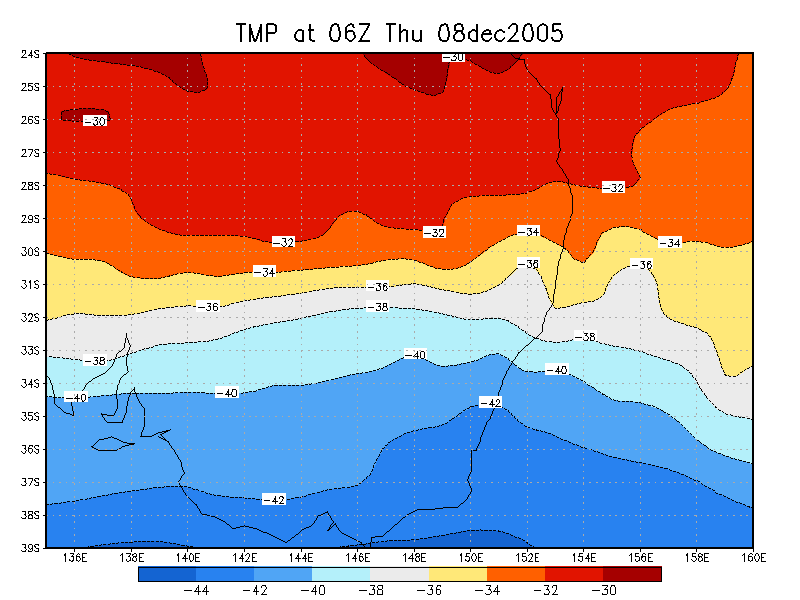 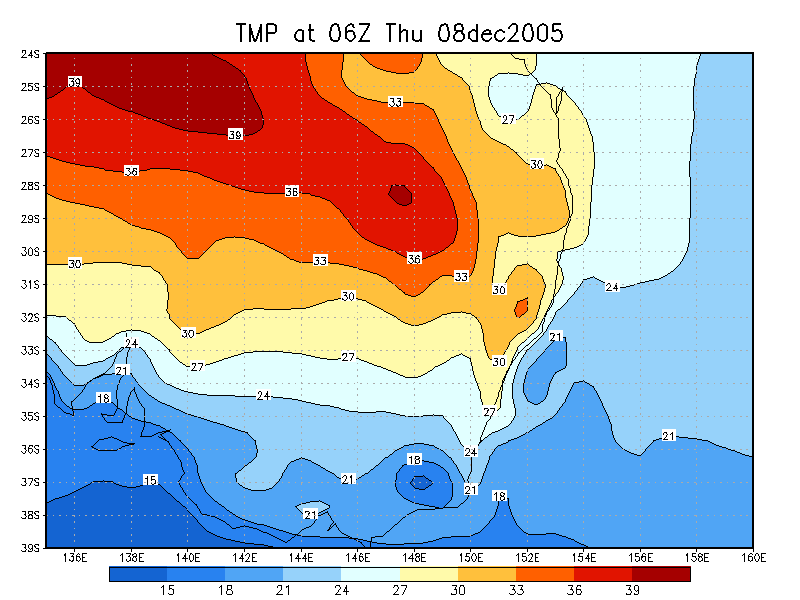 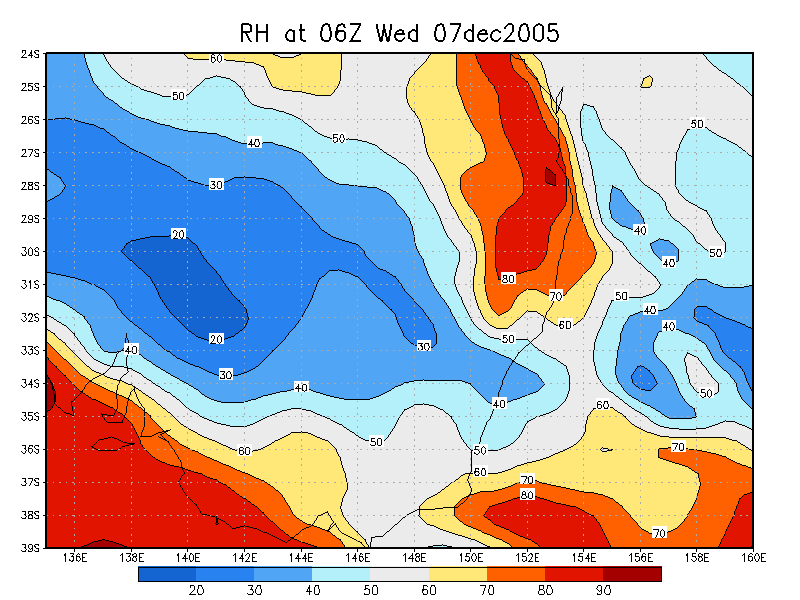 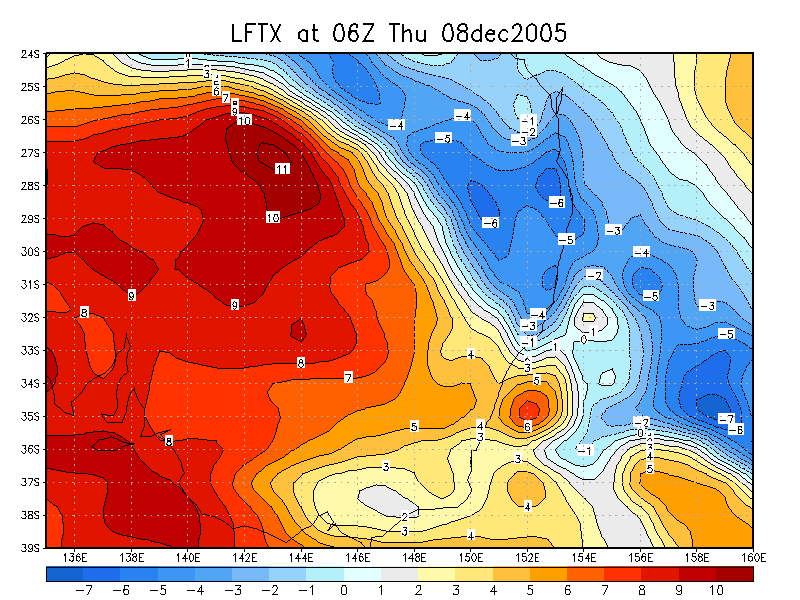 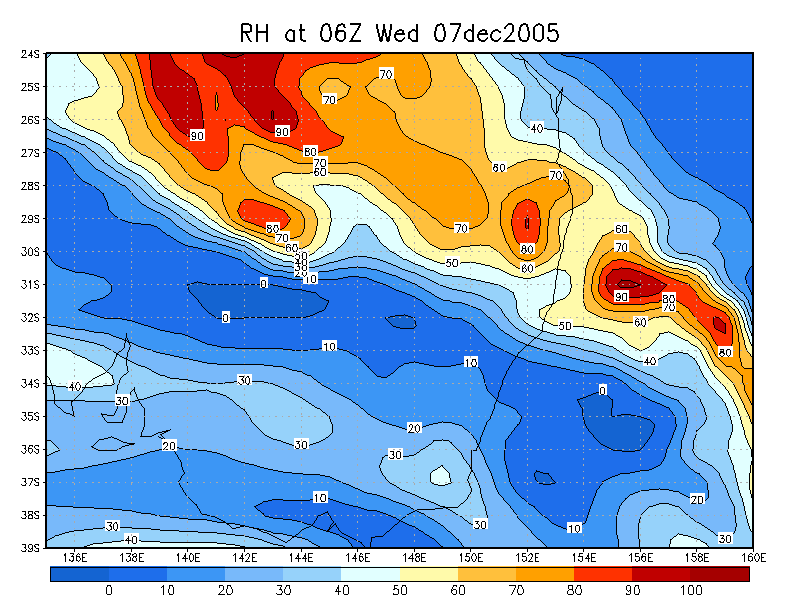 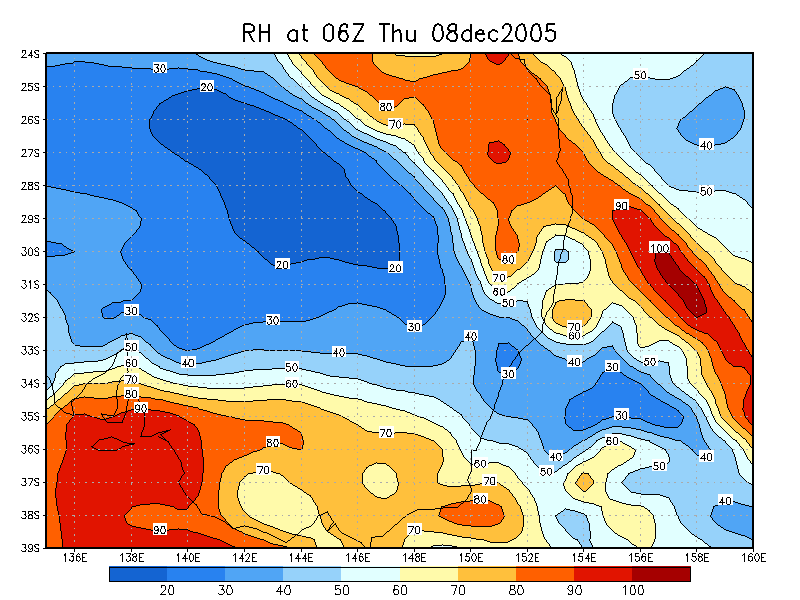 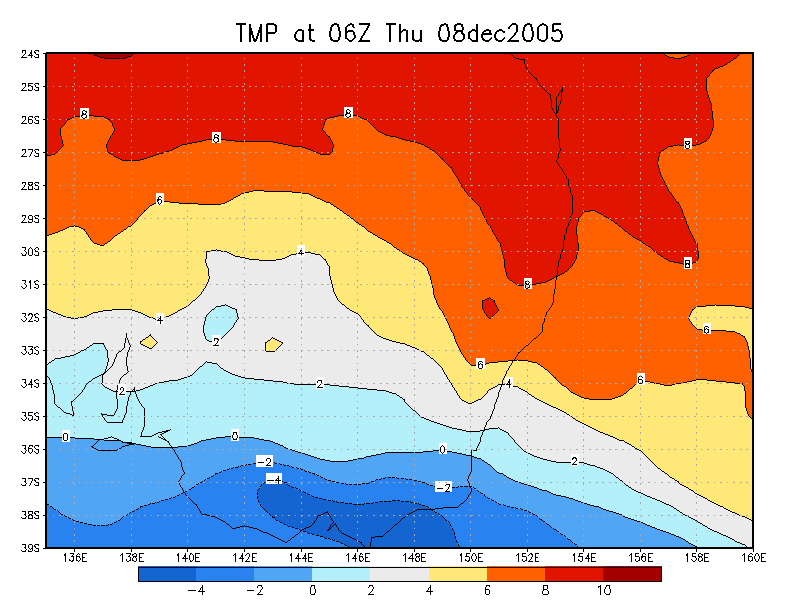 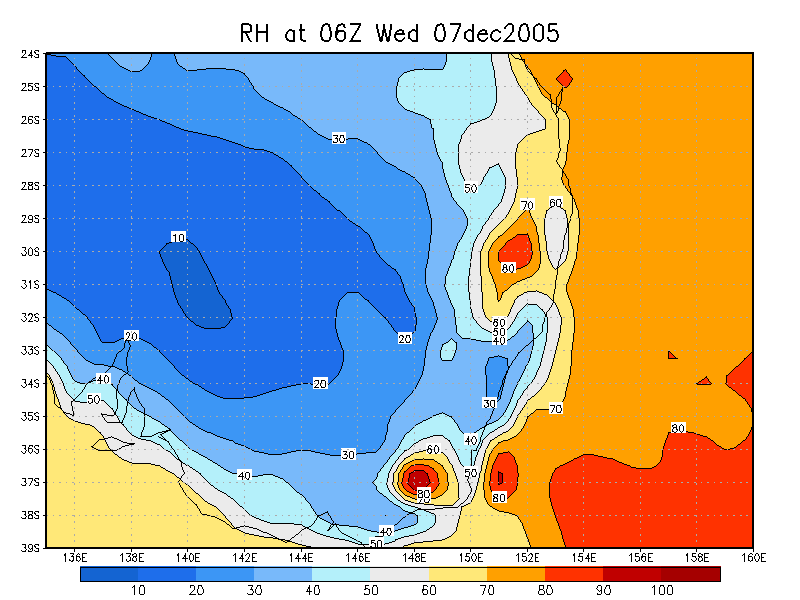 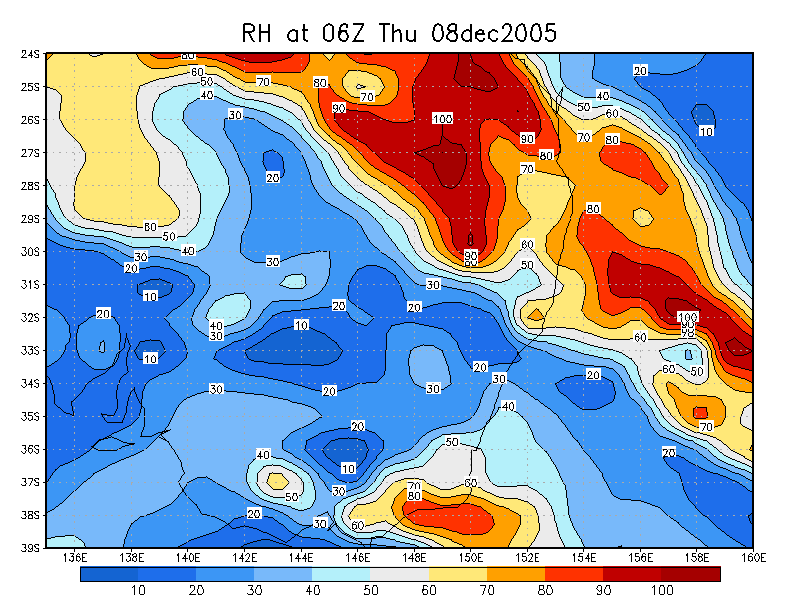 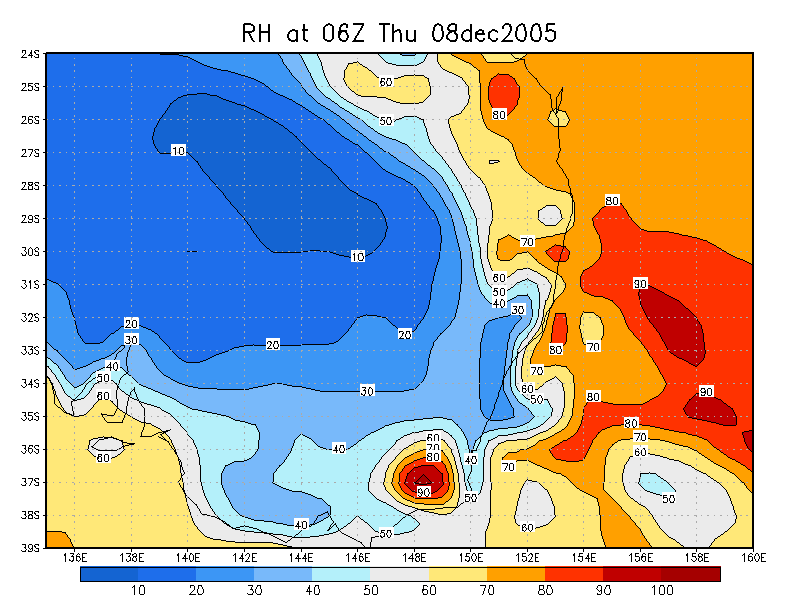 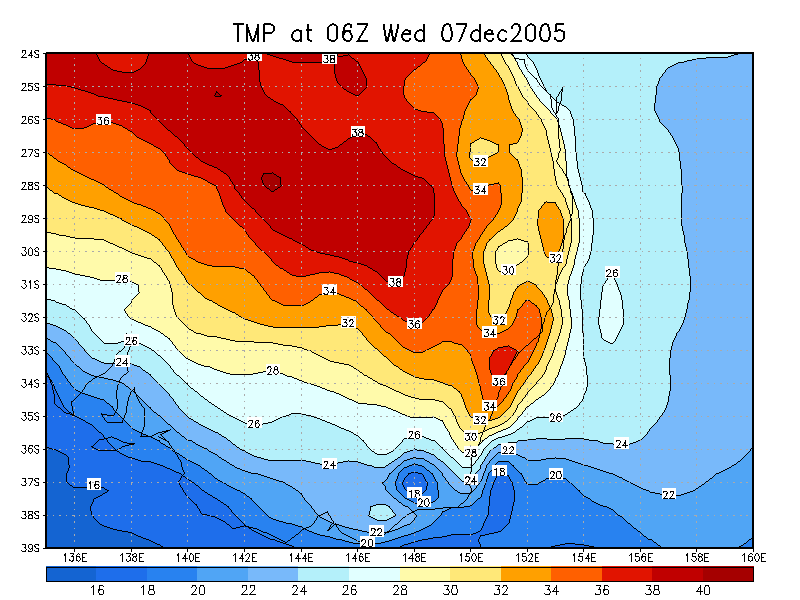 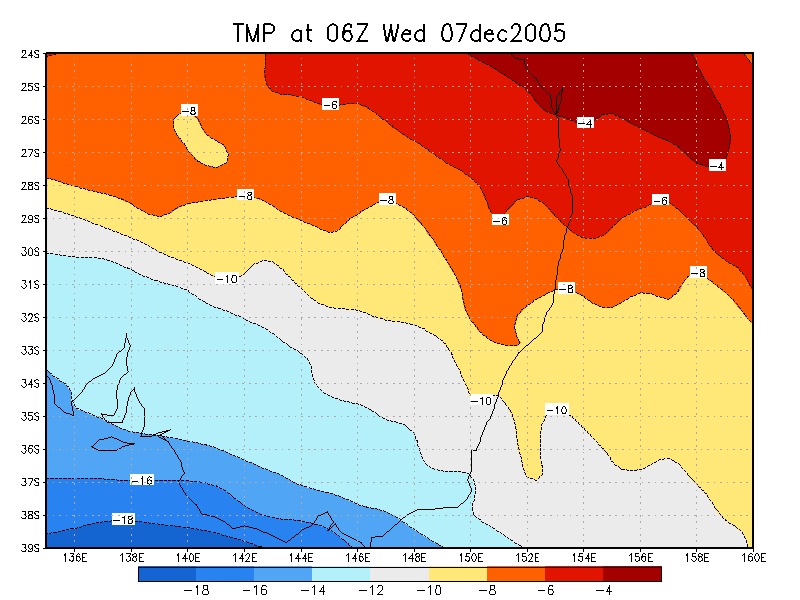 Instability was quite high – possibly over 3000 j/kg given the high temp/dewpoint combinations. 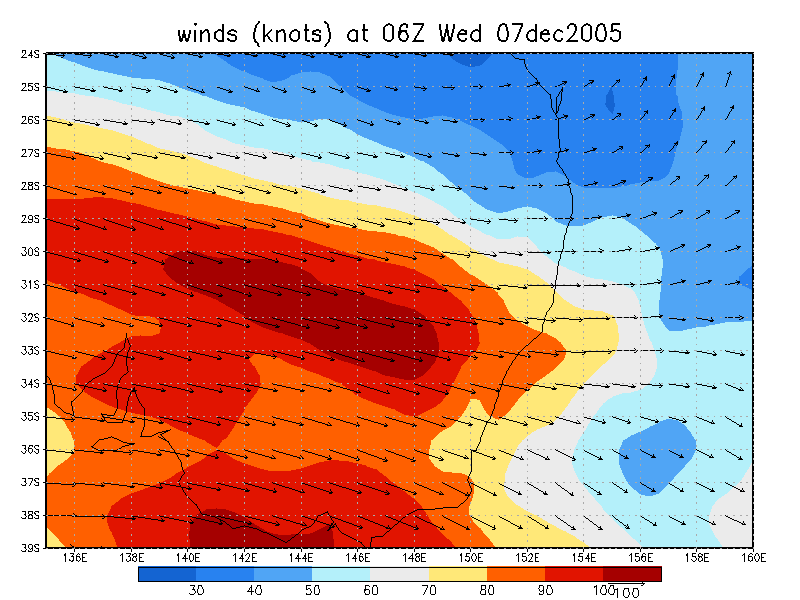 Shear was quite strong, as was becoming quite a habit this season, and despite some earlier forecasts that it was quite linear, there was still 90 degree turning of the winds between the surface and 600hPa on the GFS analysis run. 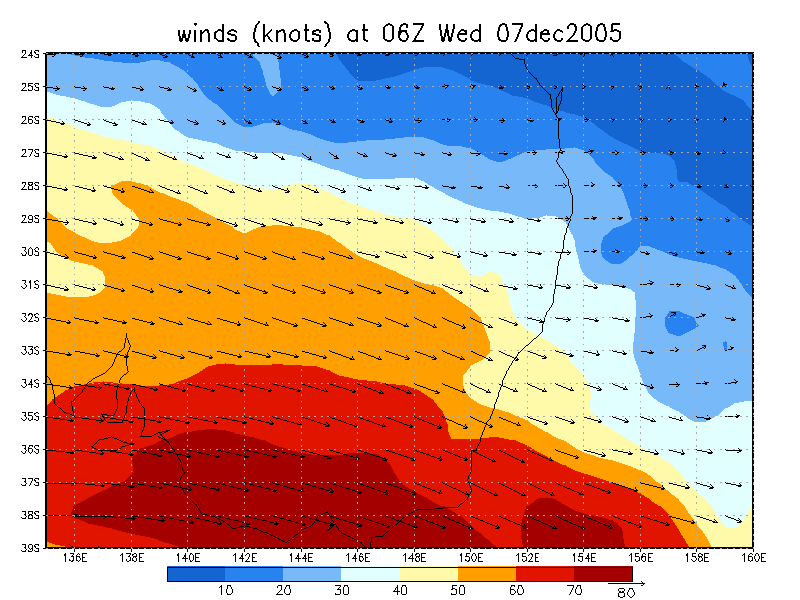 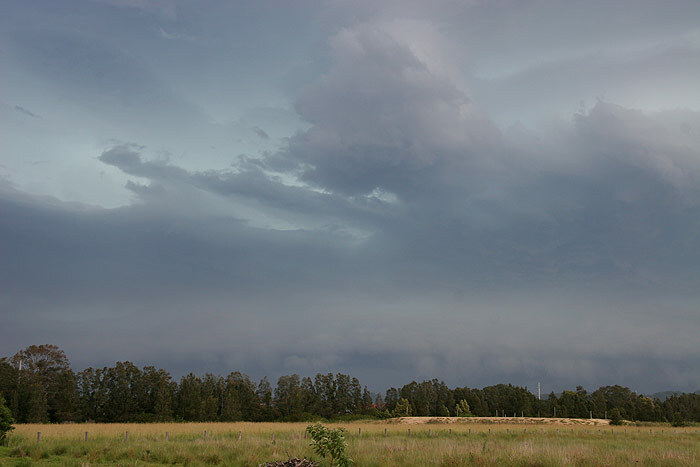 A squall line was expected, however there was still the chance of the odd supercell. 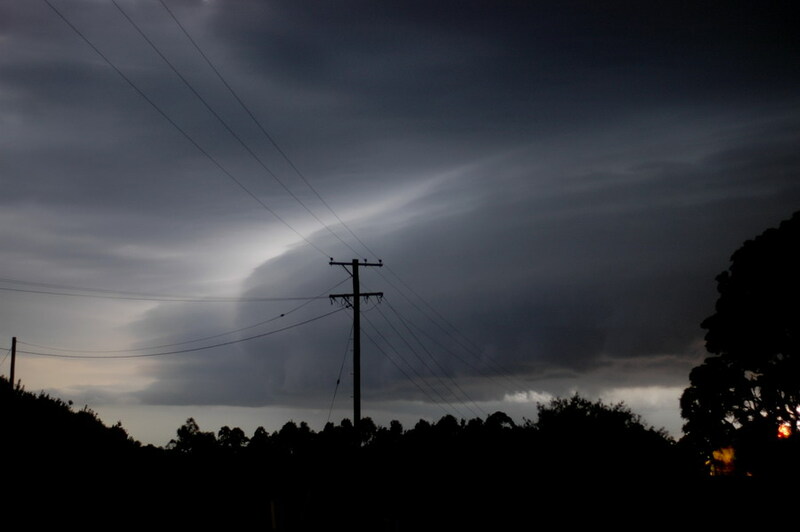 A relatively warm atmosphere, along with ample mid and upper level moisture meant the chance of giant hail was reduced somewhat, but very heavy rain, large hail and severe winds were all likely. 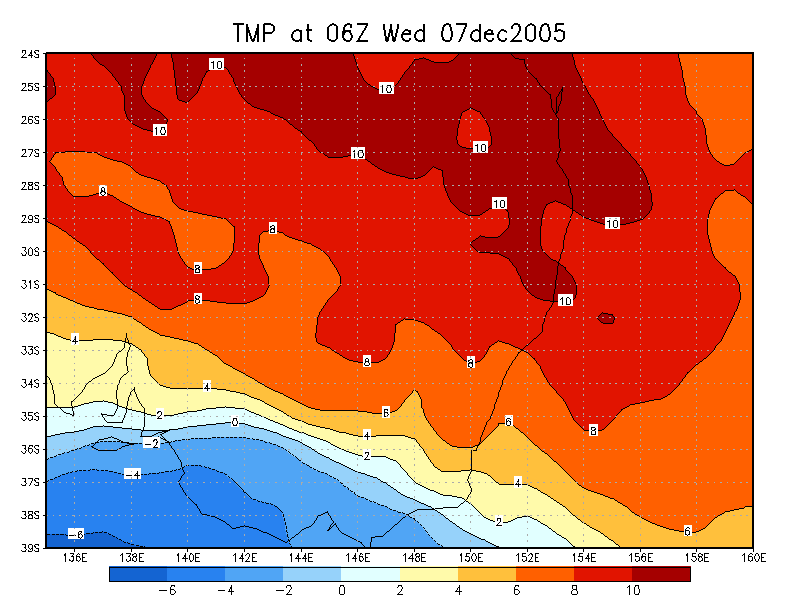 With 850 temps above 20C, it was not surprising that development kicked off a little later than usual. 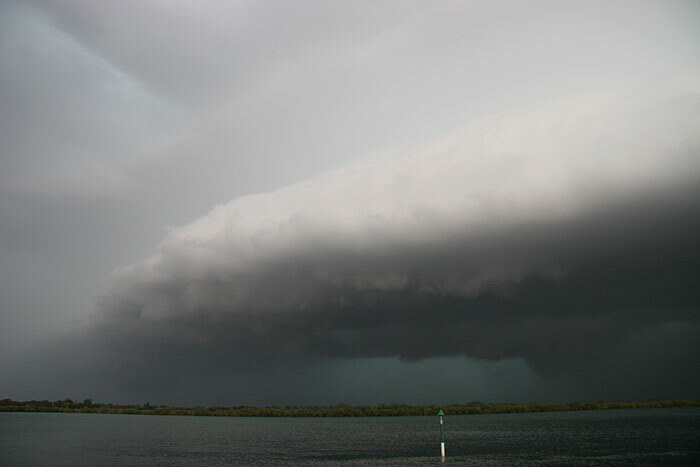 I headed out to Tregeagle at around 2.15pm. 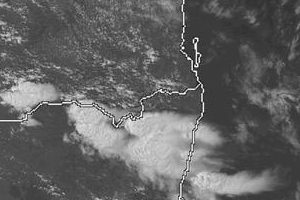 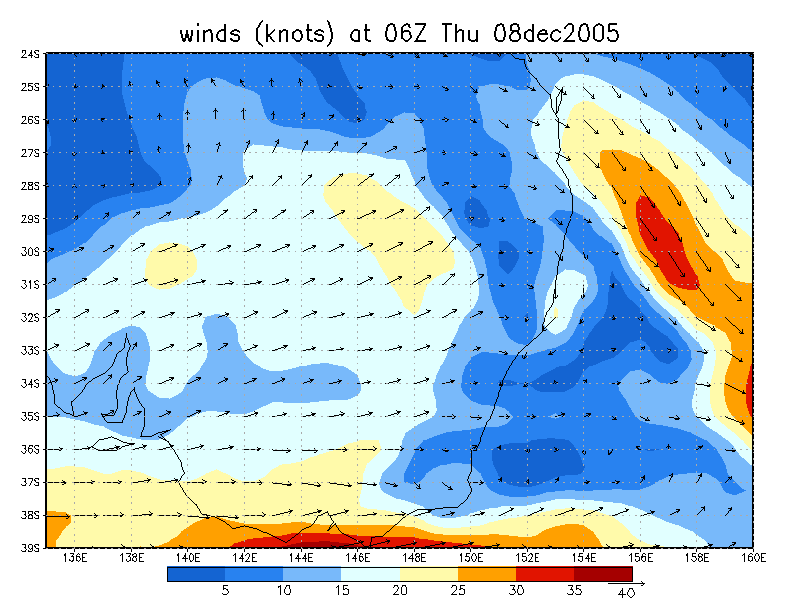 Despite activity looking a little weak, its position near Mallanganee meant that it would not take long to get to the coast and hopefully intensify. 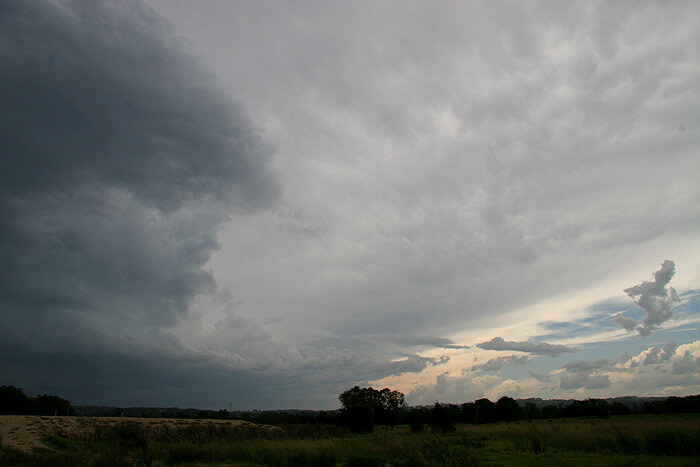 As I was driving out to my initial spot, a huge clear-air CG popped out of the fairly high topped anvil and probably landed upwards of 10km away from the storm. 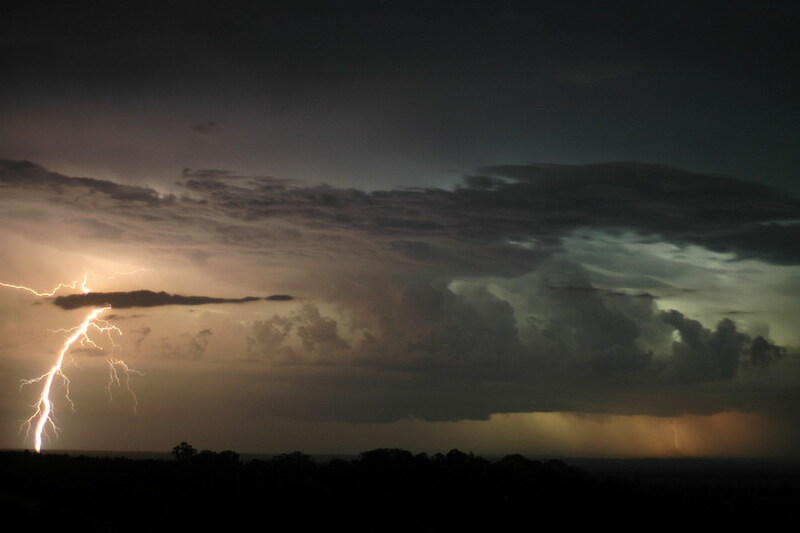 I thought this was testament to the high levels of energy in the atmosphere, and it seemed like I was in for a good afternoon! 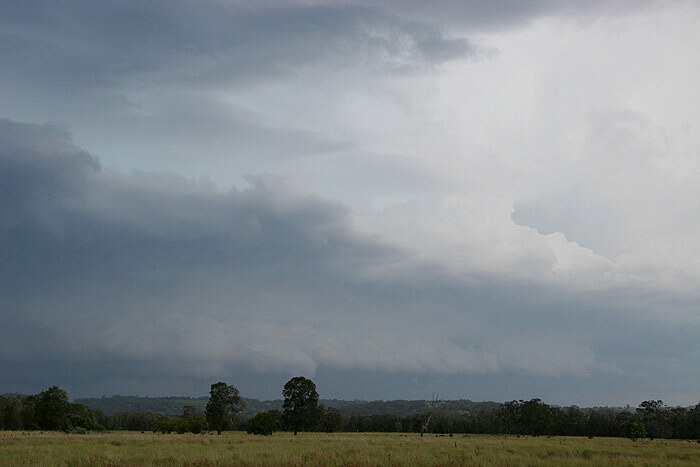 When I stopped, high cloud was ruining the contrast, and the storms didn’t look really amazing, but still quite solid given it was the initial development. 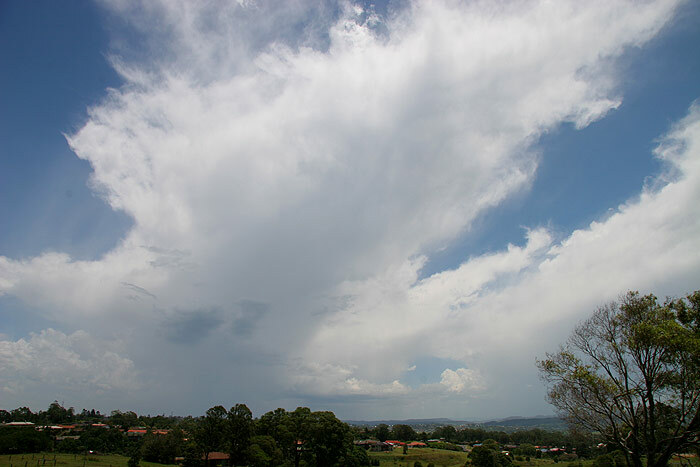 I was excited by the bubbling anvil overhead – often a sign of strong updrafts. 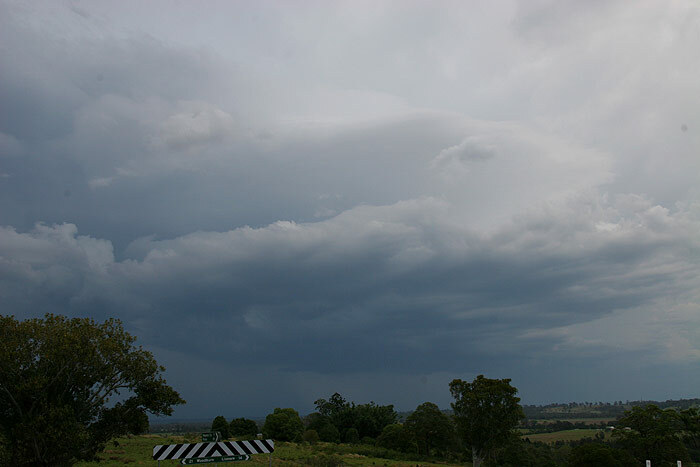 I pressed on to the Lismore to Woodburn road and stopped for another photo. 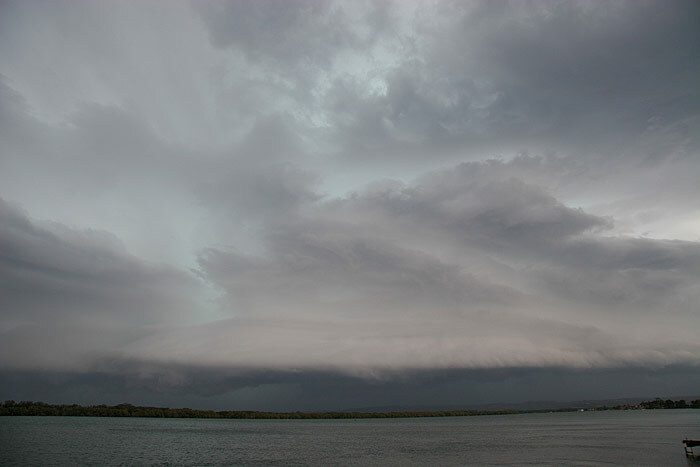 The cell was still pretty high based, and not all that exciting looking. 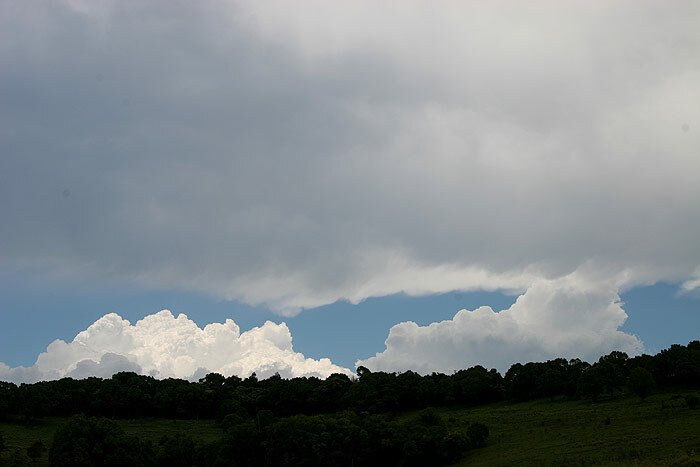 However above the updraft there was a nice smooth rounded region. 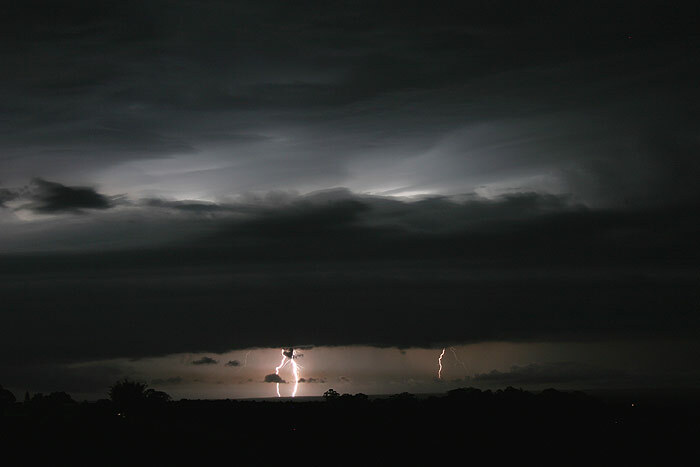 CG lightning frequency was beginning to intensify now. 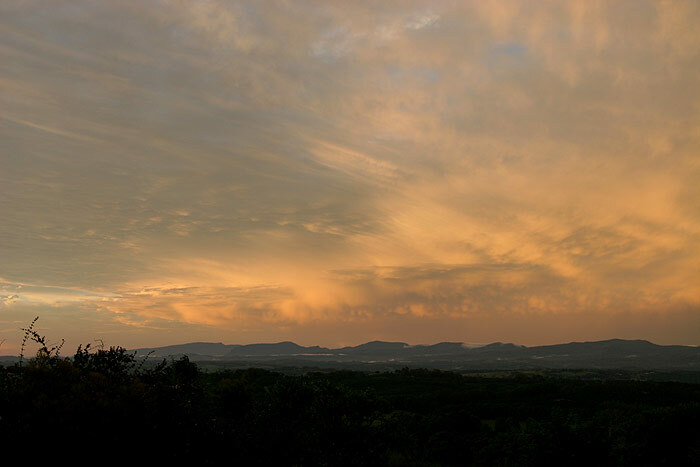 I continued to a lookout on the road that leads to Coraki. 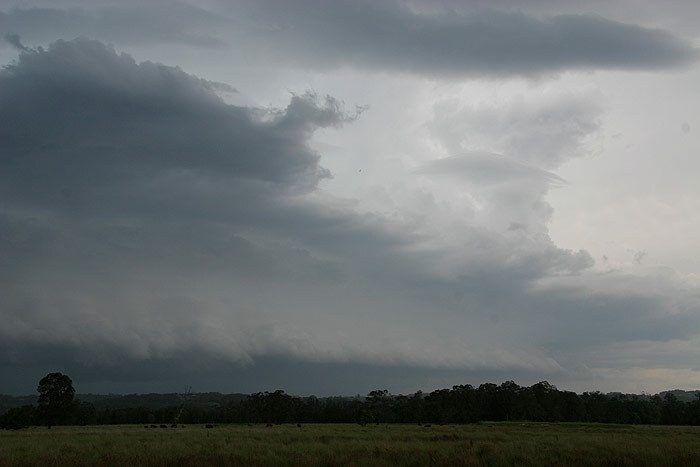 Again, the cell had a kind of smooth, rounded look above the updraft, although it was obscured slightly by other cloud that was now moving in towards the storm. 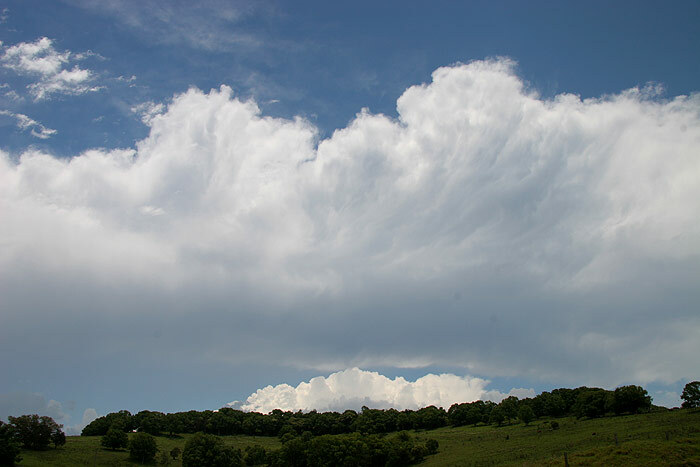 The updraft seemed to be staying ahead of the precipitation area, which was a good sign. 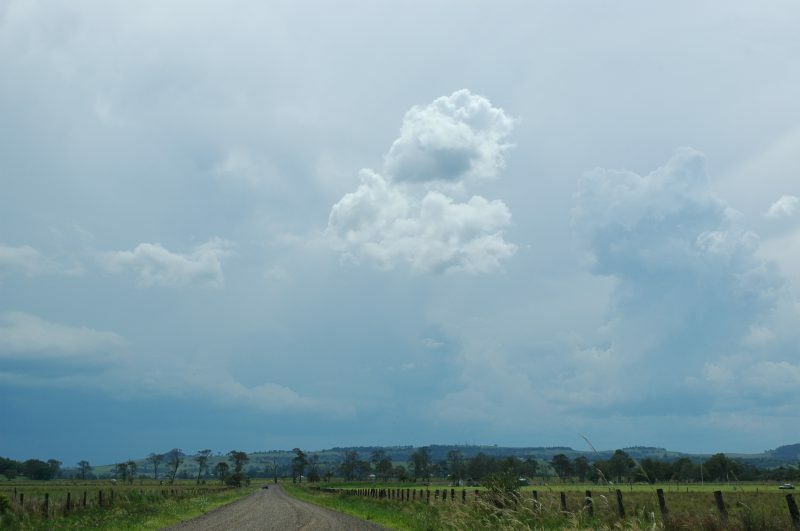 Back on the road that leads to Woodburn, I took the turnoff to Broadwater, as the cell seemed to be heading more ENE, and I’d need to shoot up N to stay ahead. 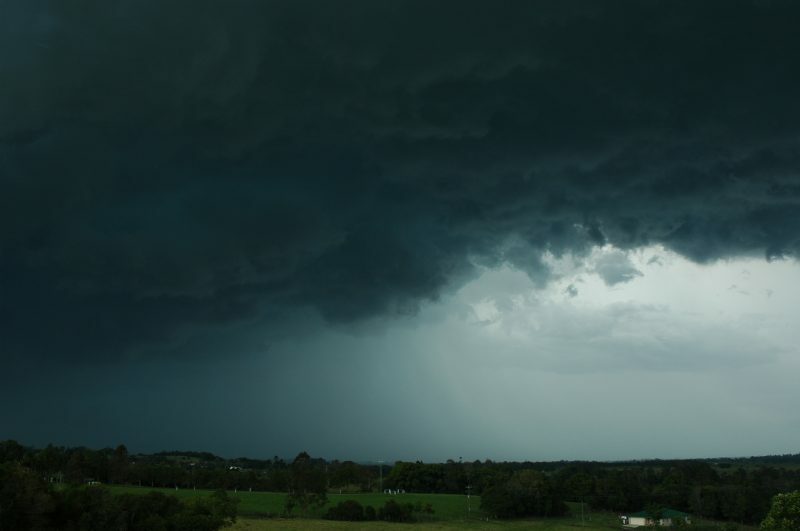 I stopped several times on the way. 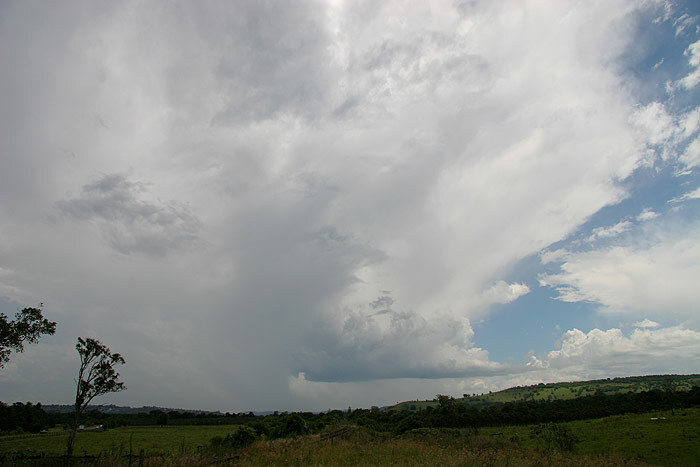 A large anvil now extended a long way E, and scuds were beginning to form under the updraft. 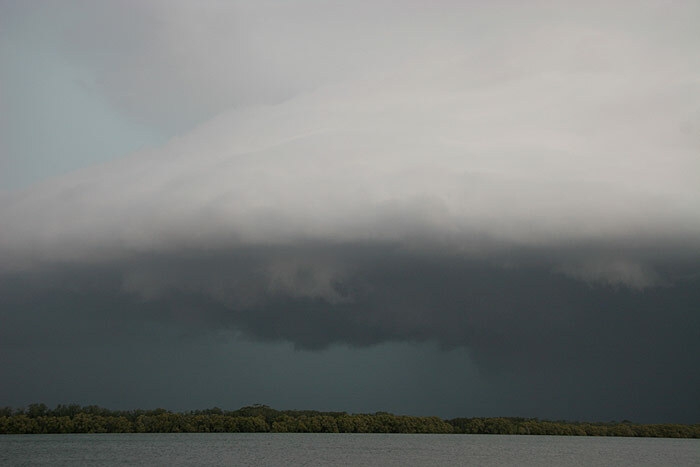 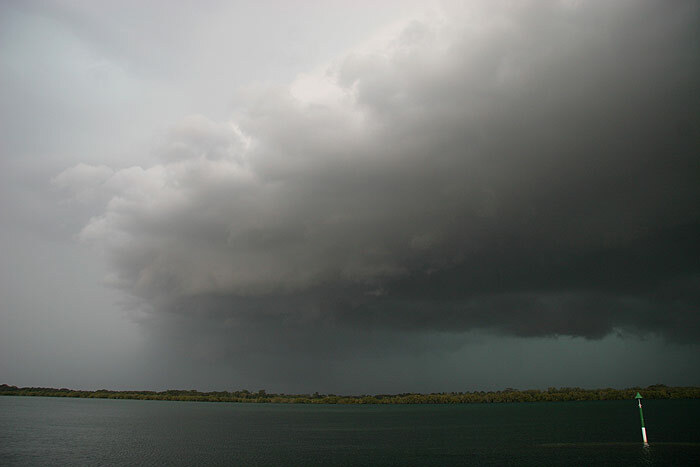 Just before the bridge at Broadwater, I got a glimpse out of the corner of my eye of a lowering under the cell’s updraft. 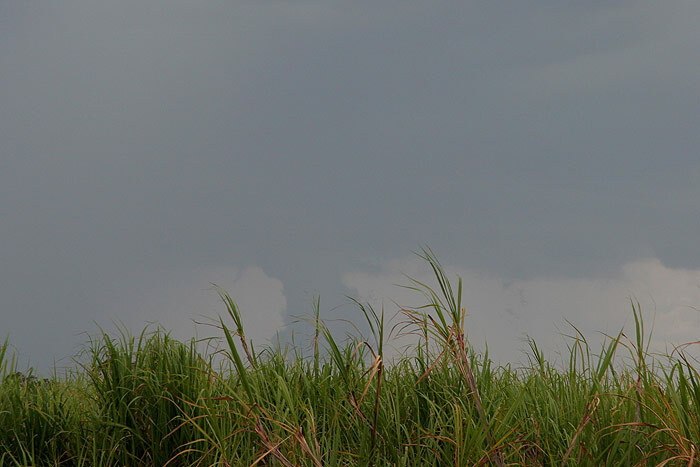 I quickly pulled over for a photo, however the long sugar cane wasn’t helping the situation much! 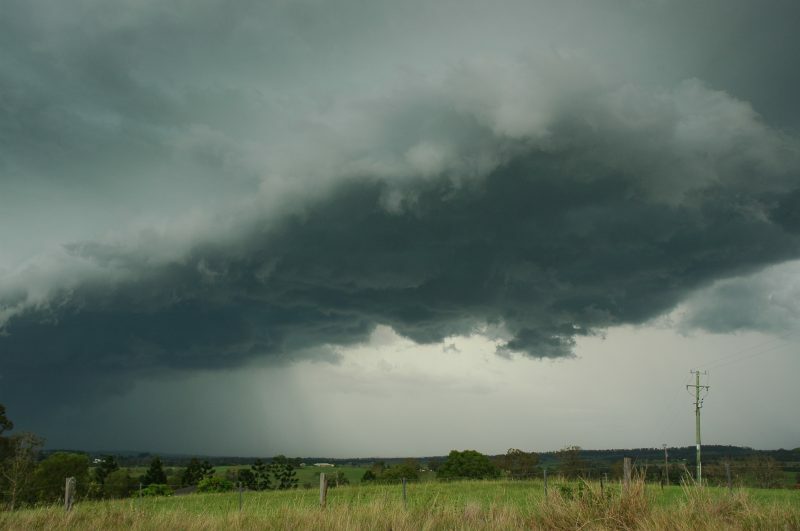 I reached the Pacific Highway and began heading N. The cell seemed to be losing intensity a bit as I got a glimpse every now and then to my W. Anvil rain was also starting to occur. 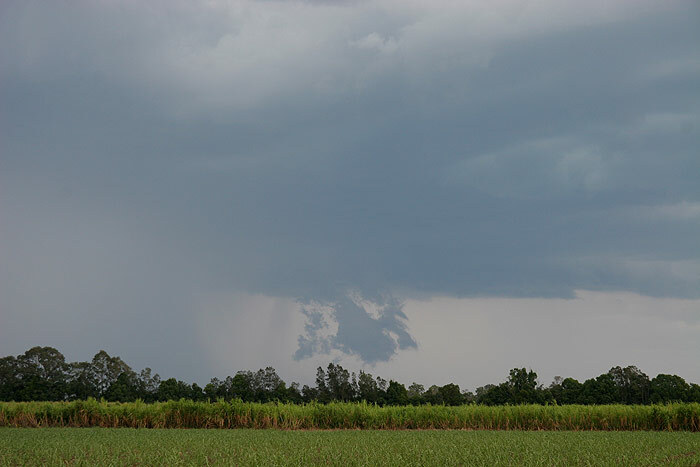 I stopped in some cane fields S of Wardell, and it was hard to pick what the cell was doing. 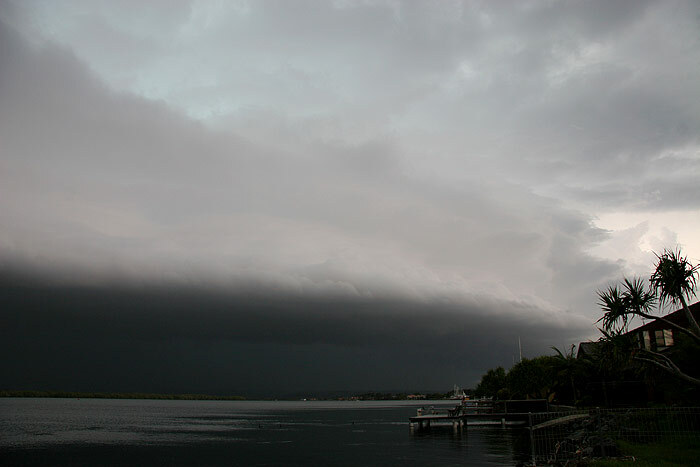 It seemed like it was raining out, but a shelf cloud was beginning to develop NW of the rain. 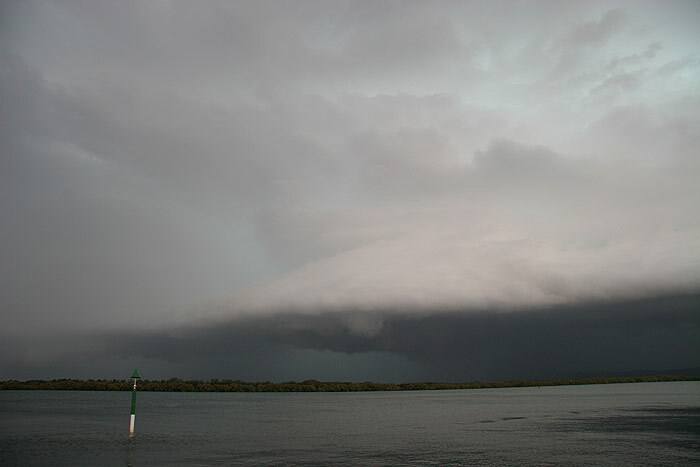 I decided I may as well head to Ballina and see what the cell did. 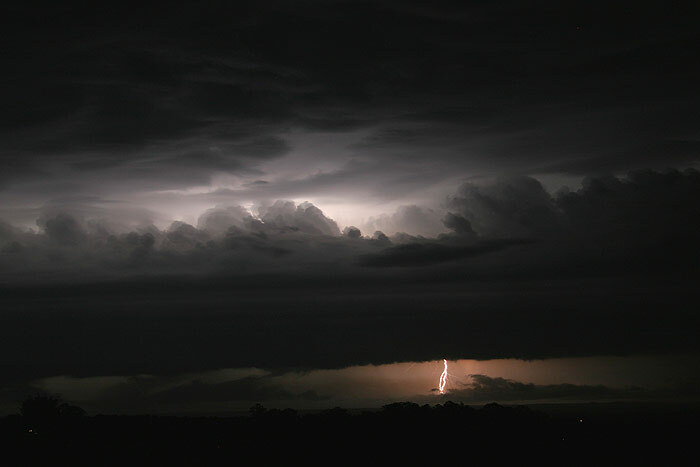 Every time I got a glimpse to the W, my excitement grew. 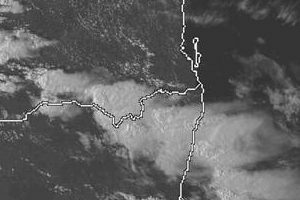 The cell appeared to be developing into something quite nasty looking. 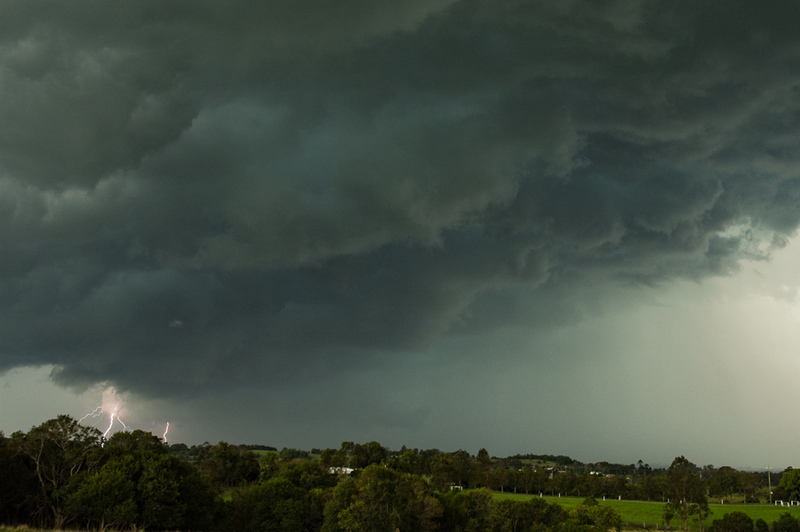 It was so green, with powerful, pulsating CG lightning occurring fairly regularly ahead of the storm. 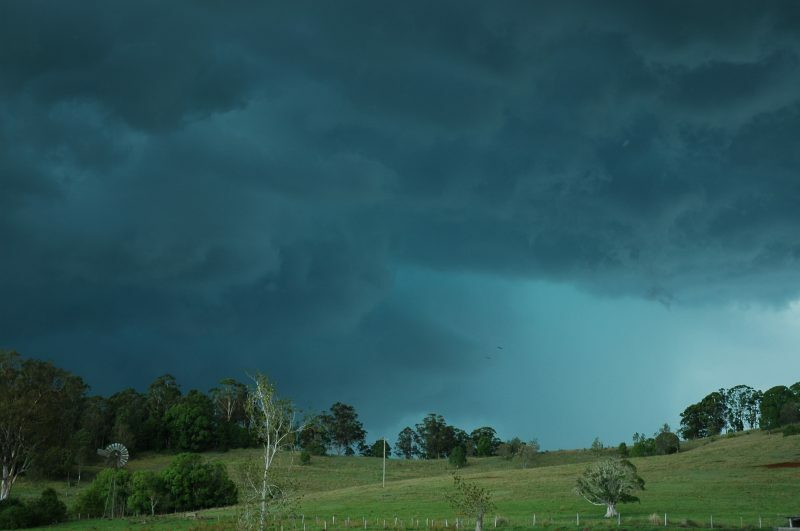 I pulled up in a field just W of Ballina to observe the approaching storm. 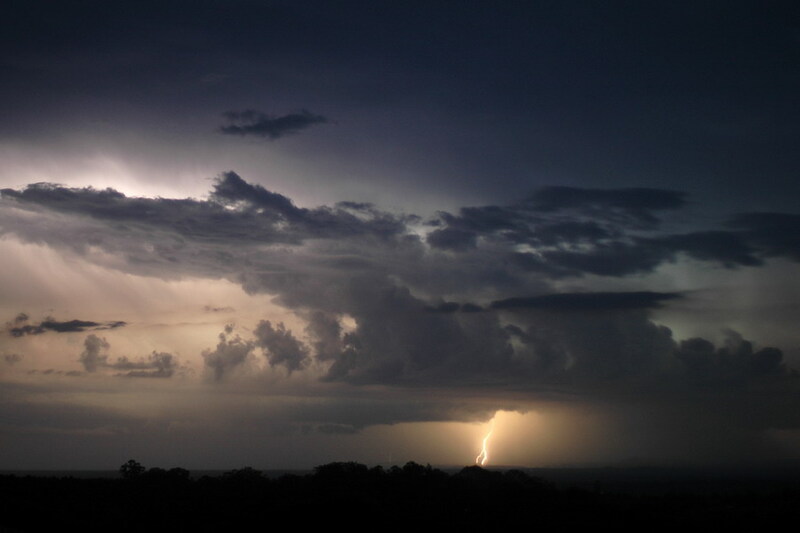 I spoke with Michael Bath, who was near Wyrallah photographing the storm as it passed over his location. 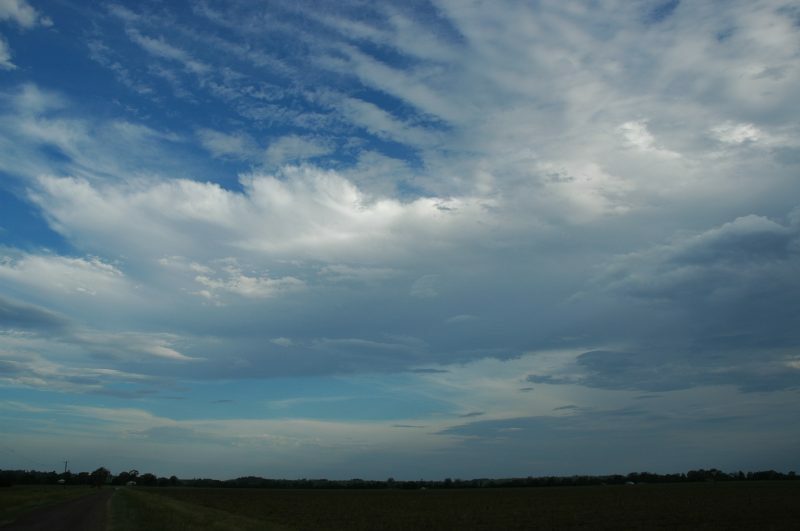 He took the following photos during the afternoon. 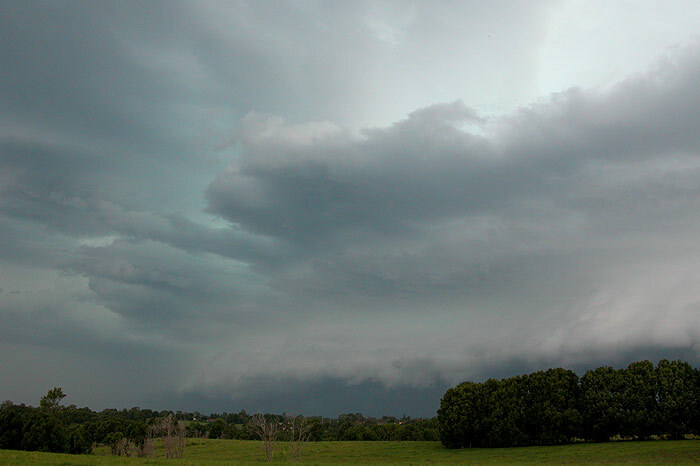 The greenage, the pulsating CGs, the large shelf cloud developing – it was all just so spectacular! 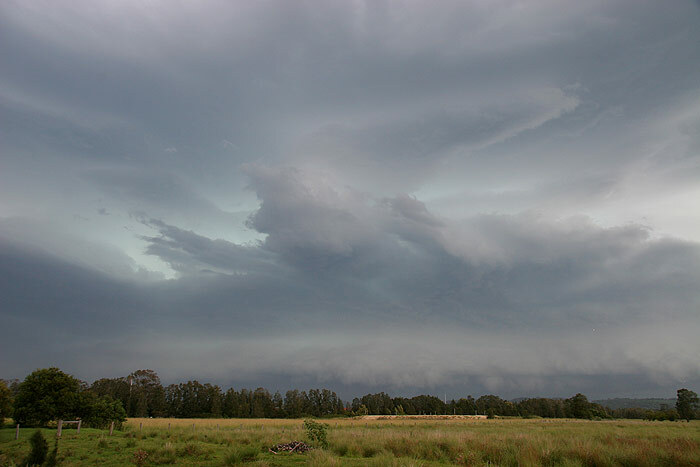 A lot of the CGs were occurring behind the trees to my SSW, so I decided to head to the river at Ballina for a better view of the incoming storm. 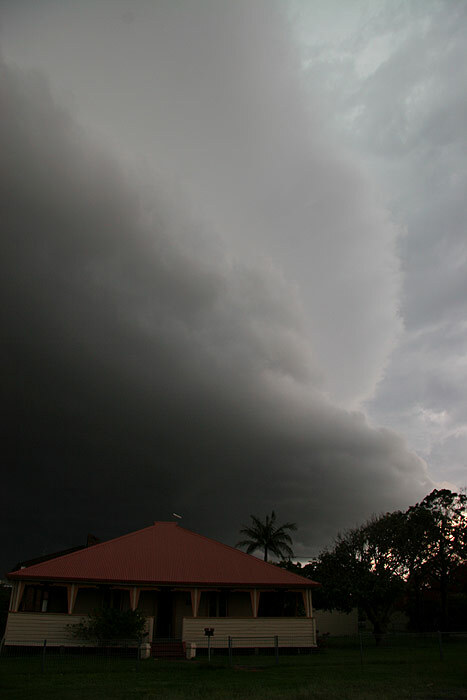 Not before some more photos of this menacing looking storm! 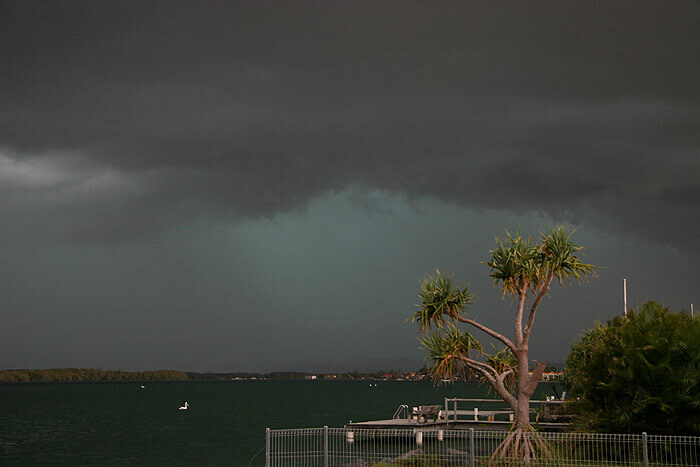 Both the green colour and the darkness of the storm as I reached the river were pretty full on. 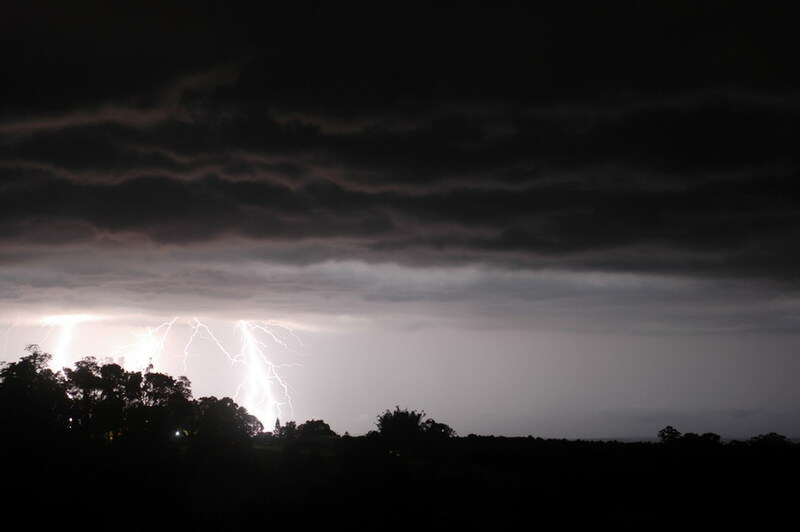 Thunder was constant now, though the CG frequency was reducing. 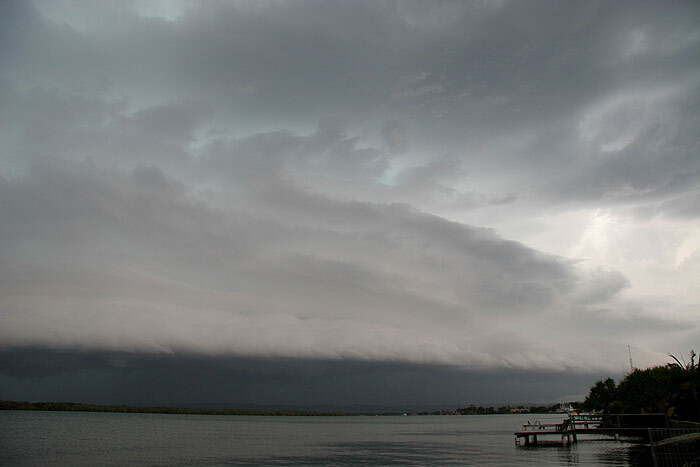 I sat by the river snapping away with the camera as the cell moved closer. 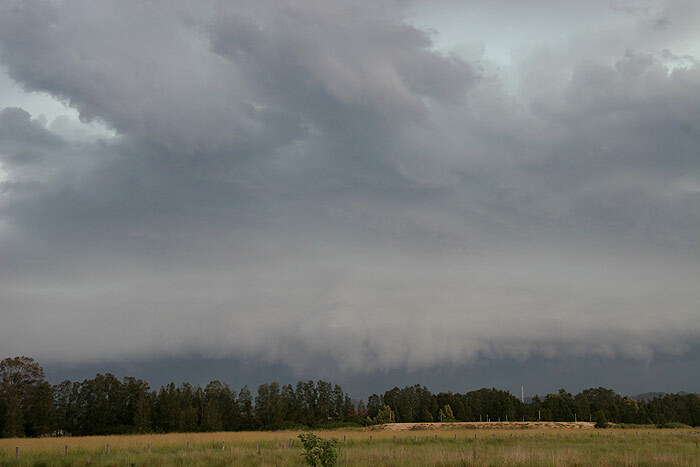 Under the SE edge of the gustfront was an area of pronounced rotation, with what looked like extremely heavy rain occurring to the NW of this area.The cell really did look so ominous. 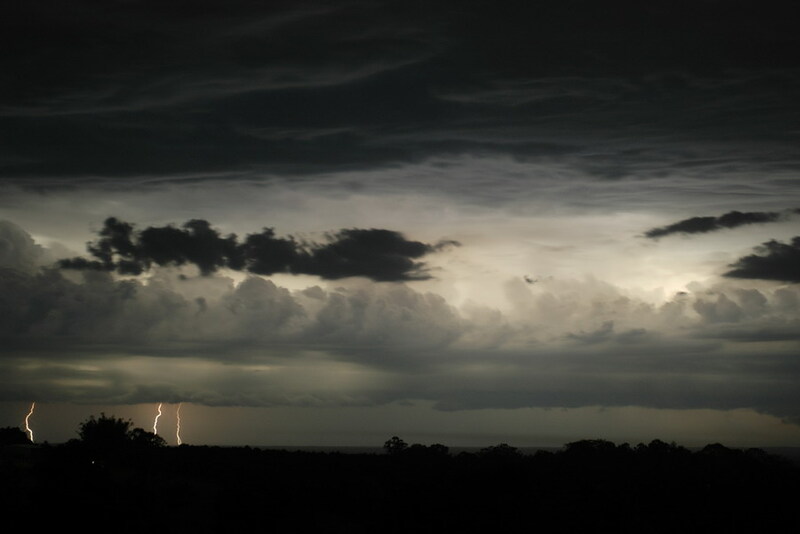 It was so dark for 4pm in the afternoon! 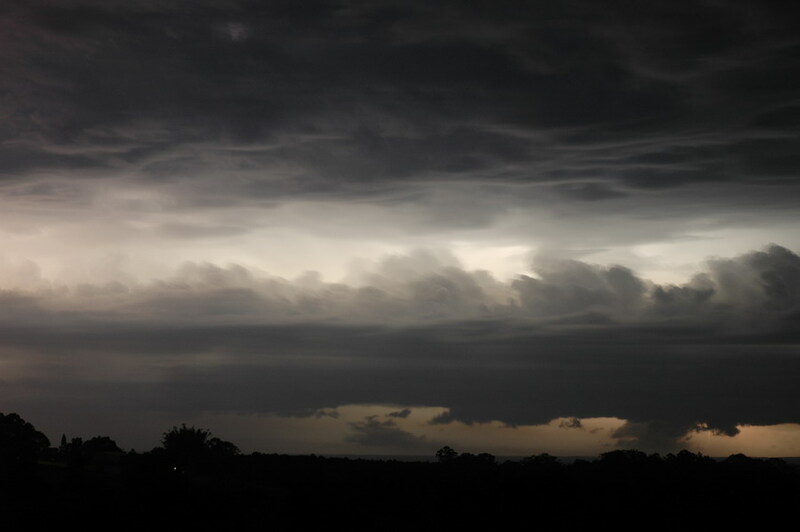 With the cell almost overhead I decided it was nearly time to head N. I had gotten a radar update from my parents, and they said the cell was heading E and was going to pass out to sea S of Ballina. 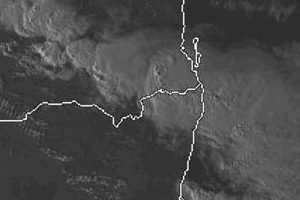 The sky certainly indicated that Ballina was going to cop it, but I had put enough faith in their radar skills to make the decision to head N and avoid the core. 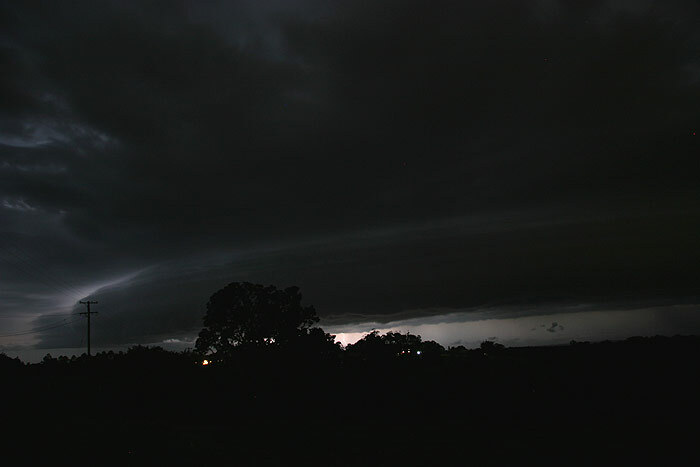 A few last photos before I shot N.
Well, there was two flaws in my plan. 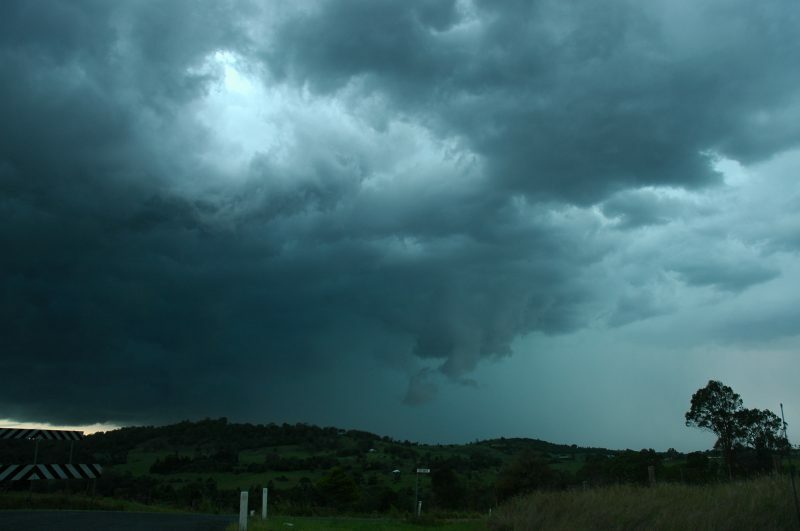 Firstly, the storm was actually heading NE, contrary to the radar update, and it was in fact heading straight for my escape route. 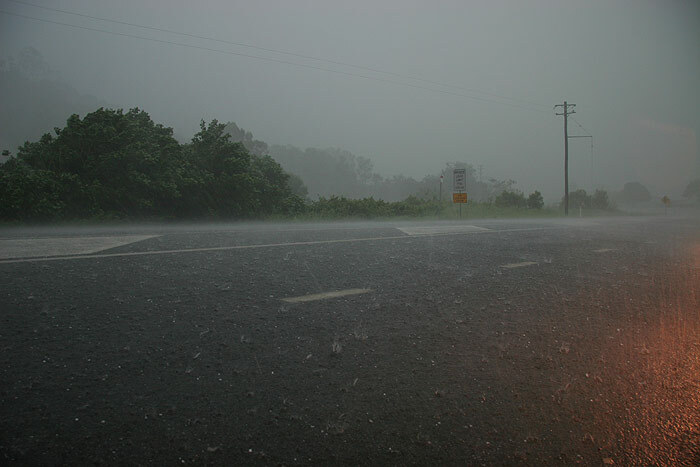 Secondly, trying to get onto the Pacific Highway from the S entrance of the main roundabout after 4pm actually takes about 5-10 minutes to do, so the rain had already started by the time I actually got onto the highway. 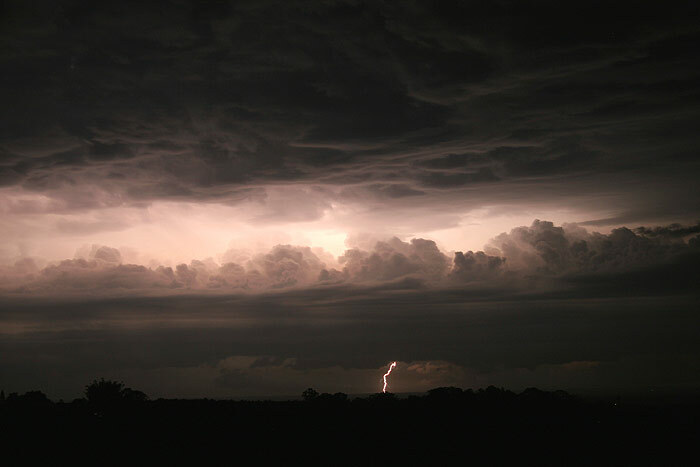 I raced along the highway, with the black and green sky, which was being illuminated every few seconds by powerful lightning bolts, sitting right beside me. 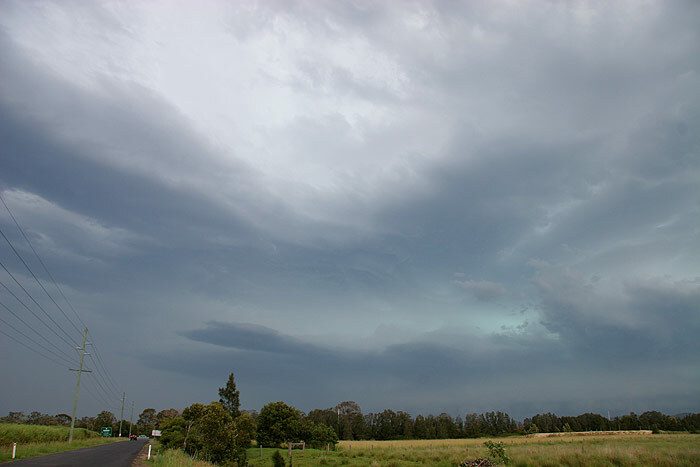 I wish I’d been able to stop to get photos of the turbulent green sky just before I entered the precipitation core – it was the most purely volatile atmospheric scene I had seen in some years. 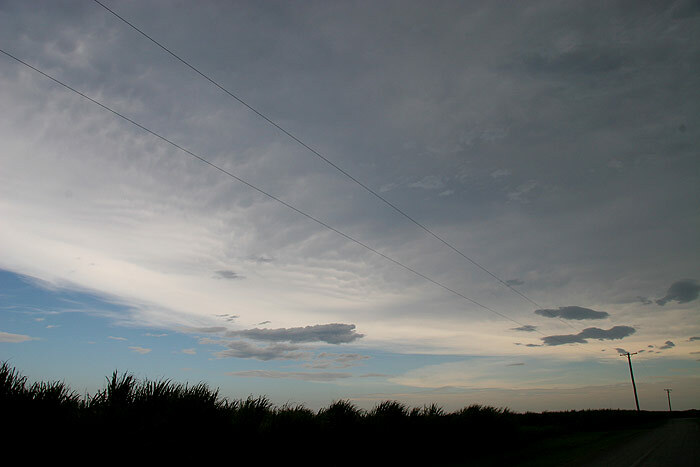 The plan was to get to a powerline and tree free area to ride out the storm. 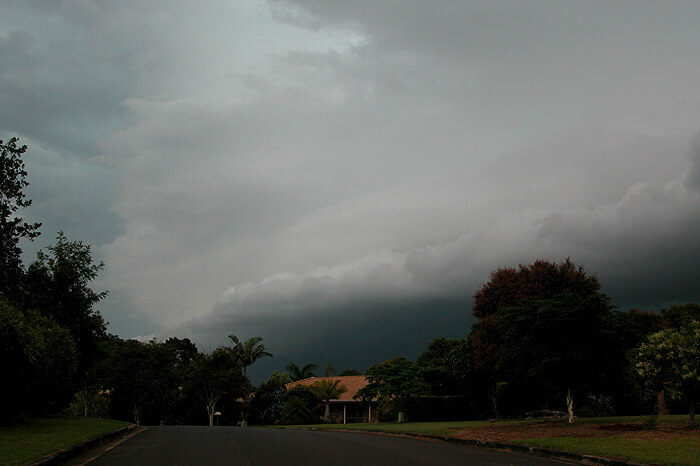 I stopped near Teven golf course when the wind blown torrential rain made driving impossible. 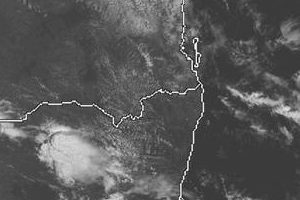 The winds were certainly severe, reaching over the 90km/hr mark and rocking the car as it was blasted with extremely heavy rain. 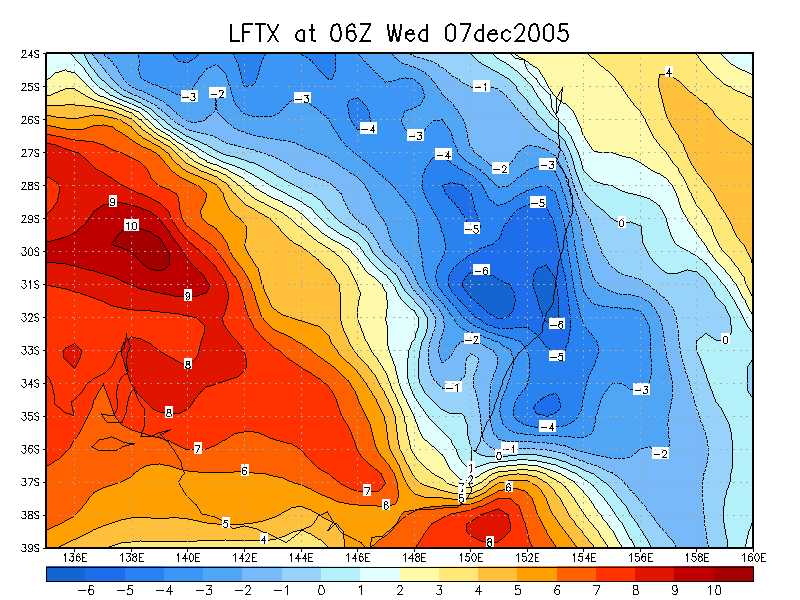 There was no shortage of CGs either, with a flang occurring every 20 seconds or so. 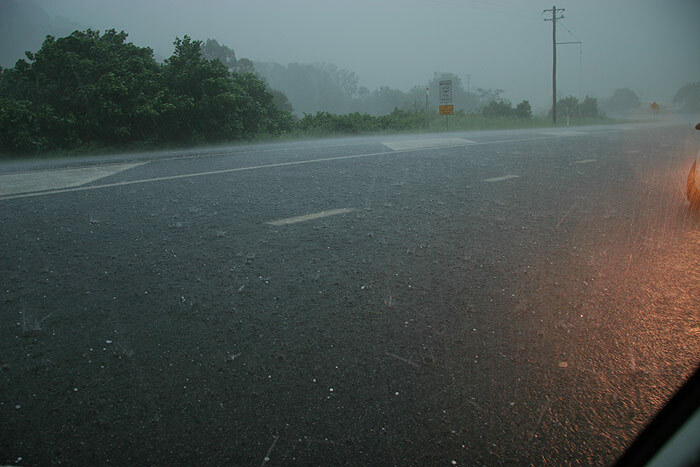 4 cars had now pulled over next to me in the full on conditions. 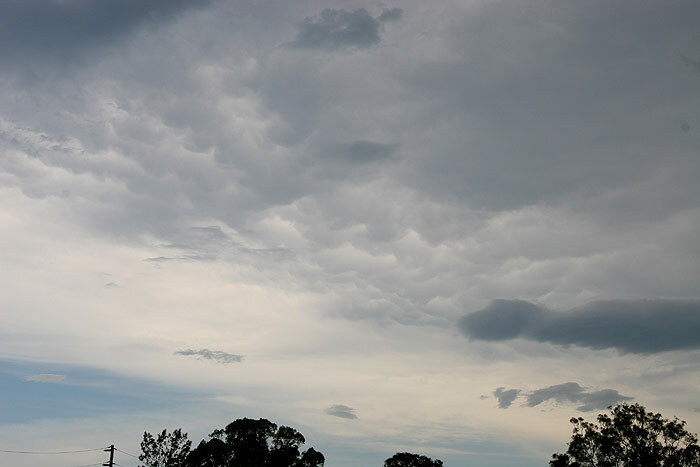 I spoke again with Michael on the phone, however the wind, torrential rain and flang after flang made it impossible to hear him. 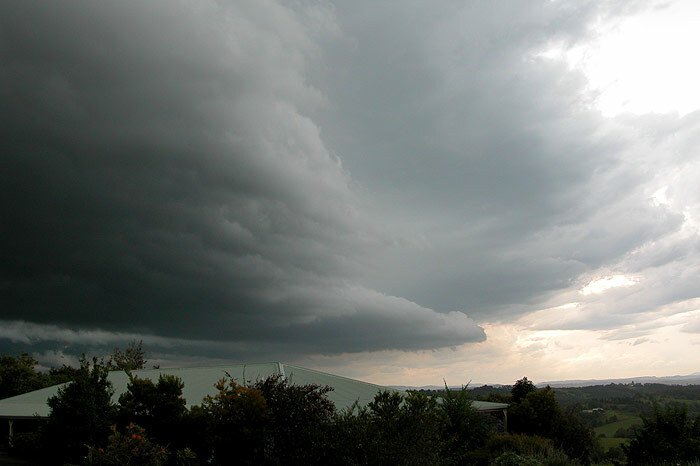 Just before I hung up though, I head the first ‘ping’ noise and thought ‘uh oh’. 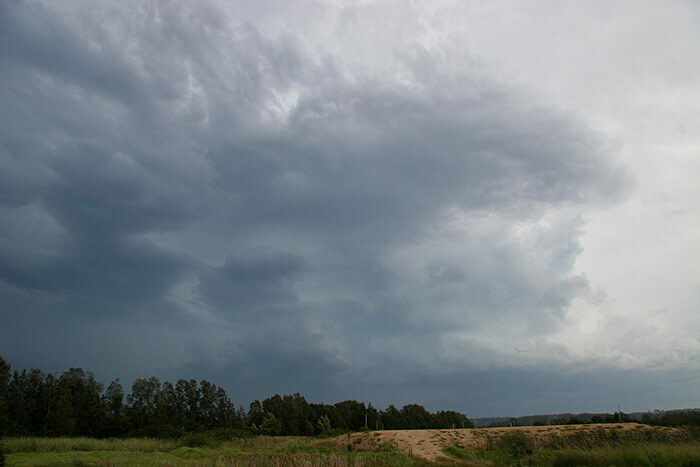 All of a sudden torrents of hail reaching up to what I estimate to be around 4cm in diameter (though most was 2-3cm with very few 4cm stones) began smashing into the car – their velocity increased by the violent winds. 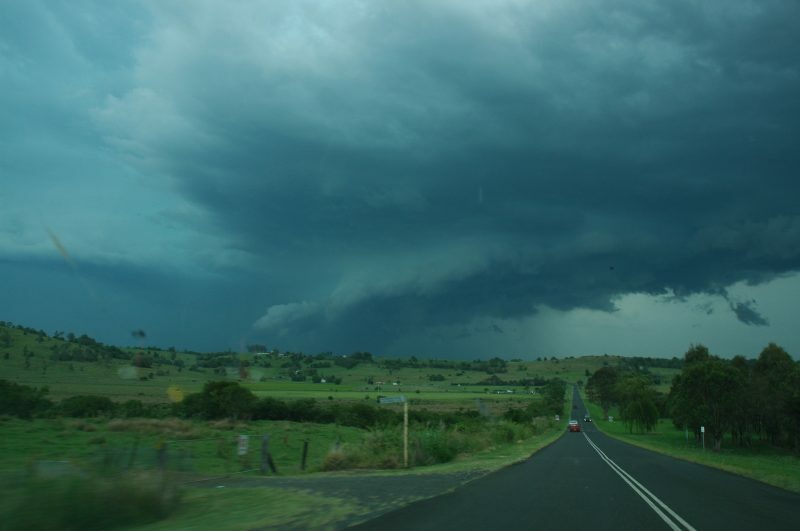 The sound of the hail on the roof was amazing, and it was the most full on weather I’d experienced in the car for some years! 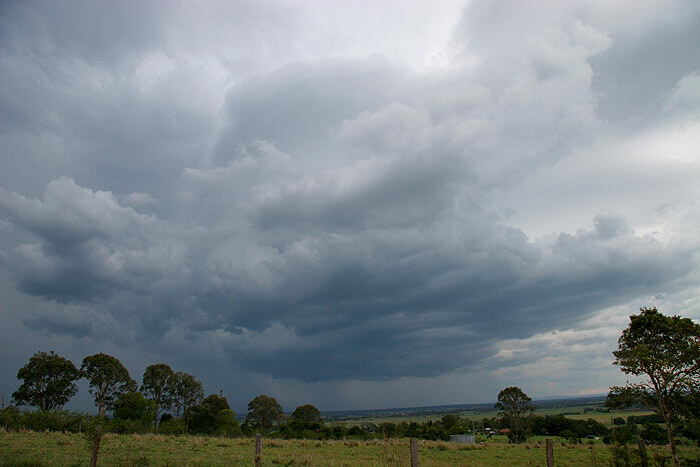 It seemed to last for quite some time – enough for the ground to begin to turn white from the hail. 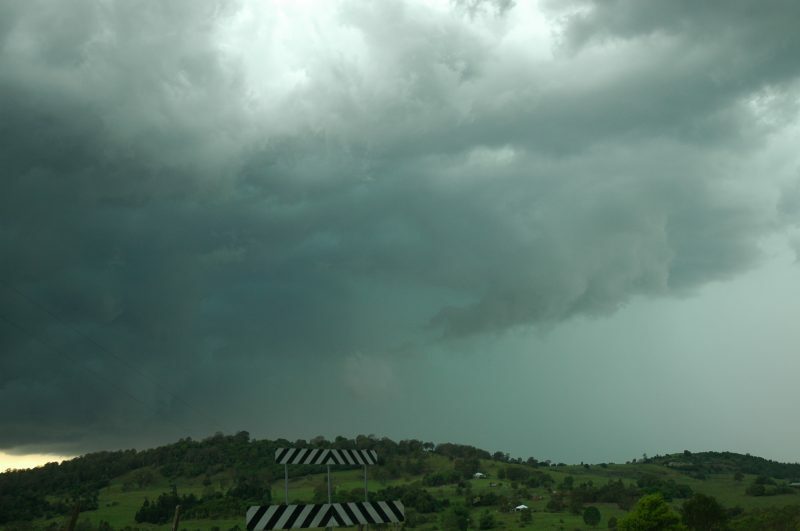 As the wind and rain eased a little, I decided to head back towards home, though pea sized hail was still falling. 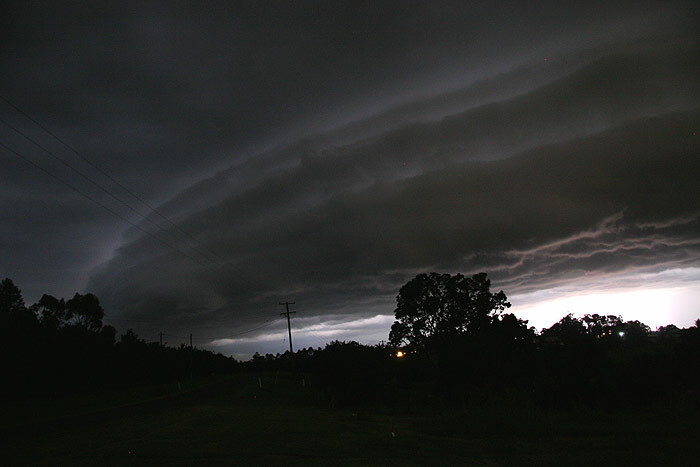 Large branches and trees, along with flash flooding had blocked the road, and I had to take an alternative route back home. 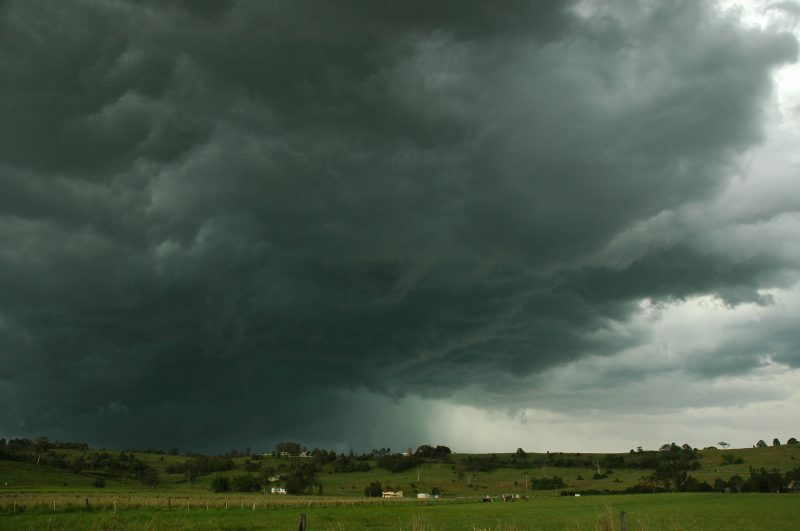 When I arrived home I found that we’d had 42mm of rain falling at up to 190mm/hr, with hail up to 3cm in diameter, and a roof full of water from a major leak! 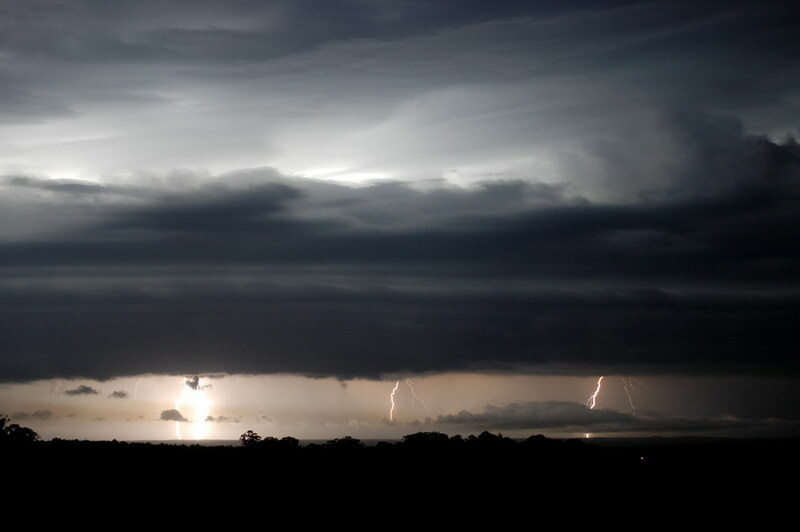 Dad had taken the following pictures of the storm from our home. 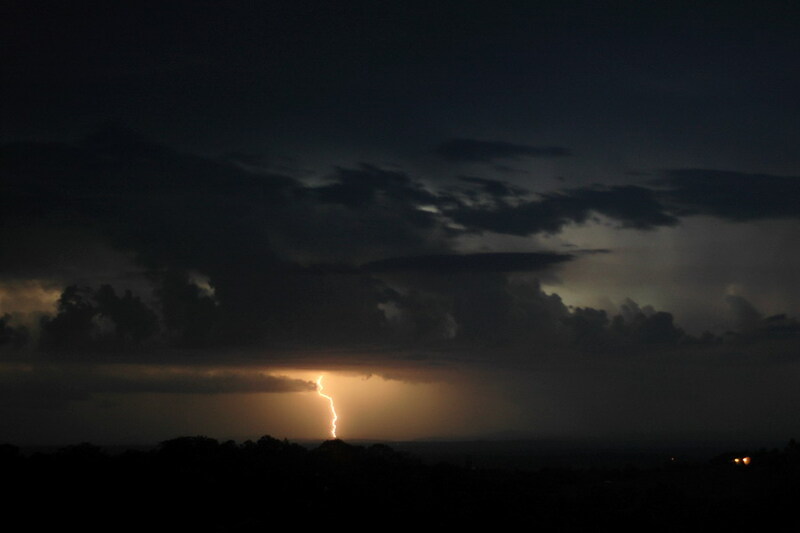 Loud thunder seemed to continue for quite some time after the storms had passed and moved into SE QLD, where they caused quite a bit of damage. 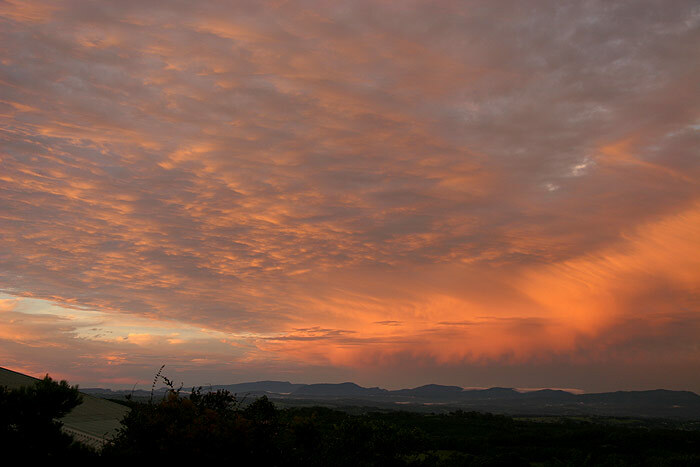 As the sun set, the storms moving away in the distance were illuminated some beautiful colours, and it seemed like quite a peaceful setting following the severe storm which had torn through a few hours before. 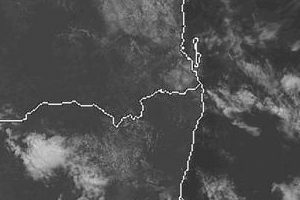 The surface trough was forecast to move though the northern parts of the Northern Rivers during the morning/early afternoon, bringing cooler SE winds. 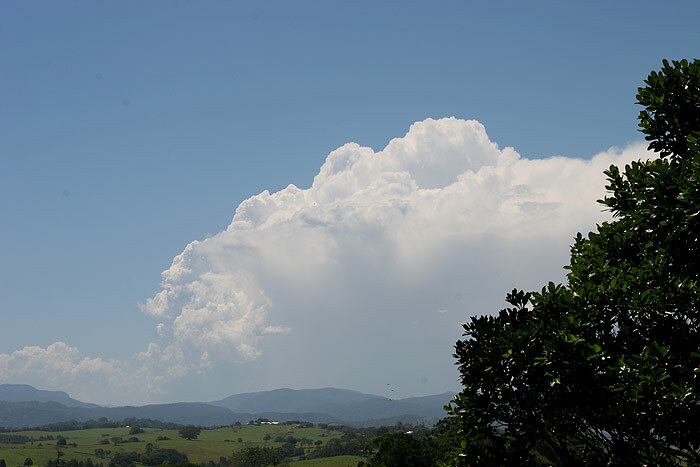 Despite the very dry atmosphere in the mid and upper levels, and gradually drying low levels, we had still expected a few storms to develop on a convergence line along the ranges to the W. And as expected, storms did begin to develop in this region just around midday. 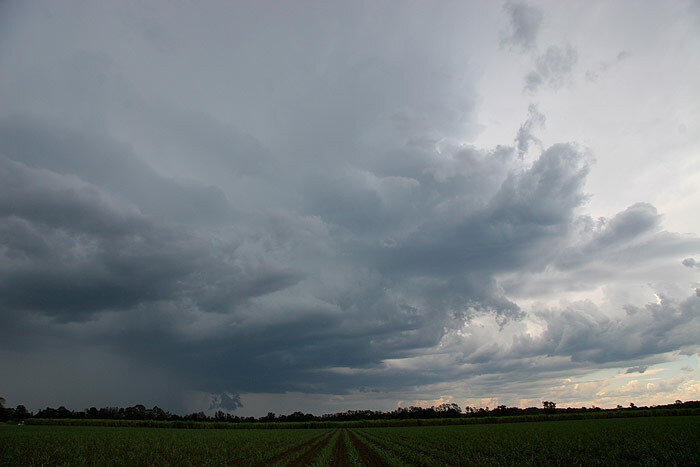 Michael and I headed to Tregeagle for a closer look, however it was clear the southern most cells were weakening quickly as the atmosphere dried out. 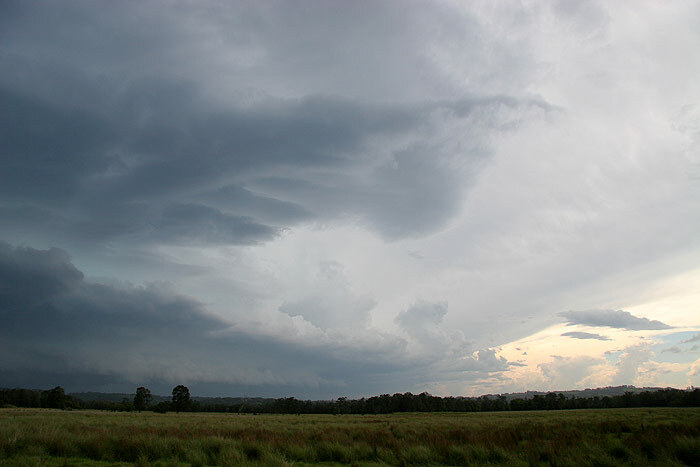 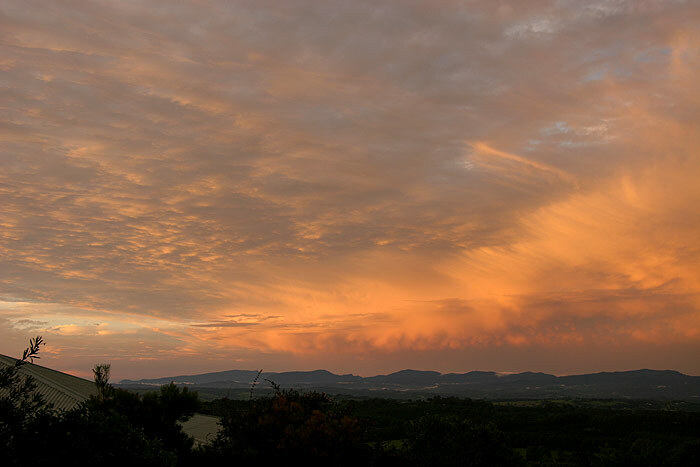 A cell WNW of Lismore became the focus. 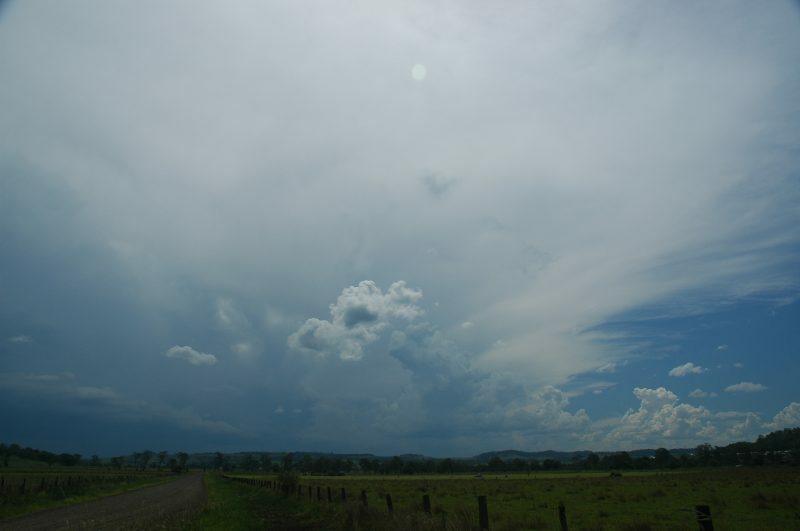 We headed to Bexhill and stopped to watch this cell move towards us, and a cell NW of Kyogle which was producing lots of anvil. 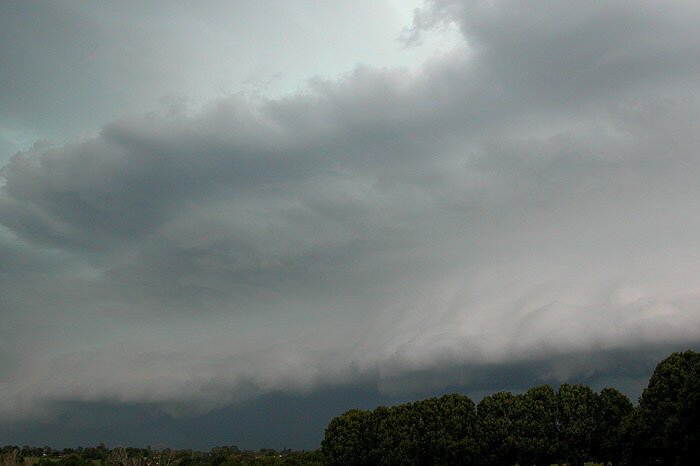 The cells were quite obviously weak, with the one to our W slowly dying, but it was still interesting to watch. 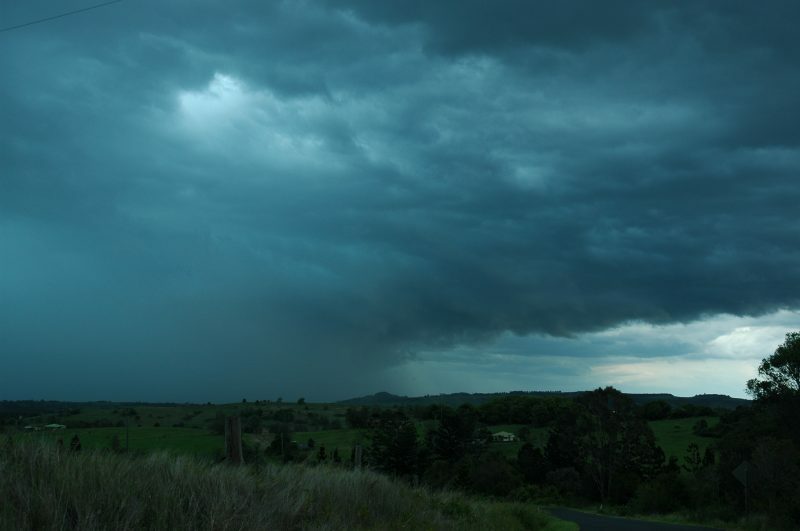 We eventually moved to the lookout at St Helena, and watched as the cell that was now located near Nimbin collapsed. 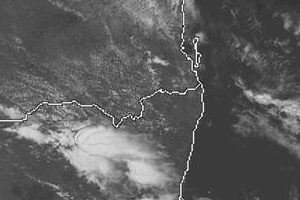 Further development occurred NW of where the first cell had collapsed, however it was obvious all the activity was gradually shifting further N as the trough moved away.